There’s nothing more disappointing than creating a quilt you like and then realizing it doesn’t quite look right anywhere your home. 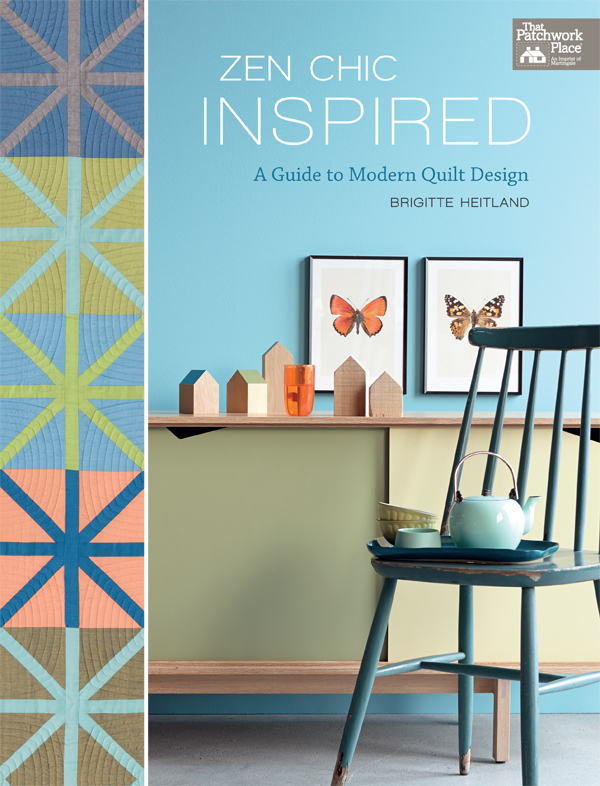 But wait, put those tissues away: Germany-based quilter, Moda fabric designer, and interior designer Brigitte Heitland has a new book that teaches you how to make quilts that will always be a perfect match for YOUR home: Zen Chic Inspired! 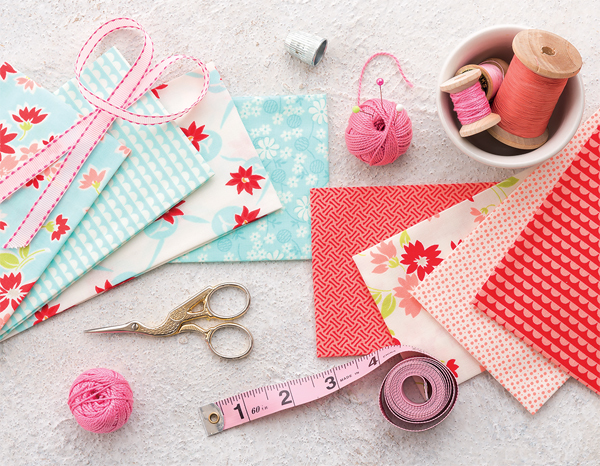 If you yearn to make quilts that pair perfectly with your decorating style—and who doesn’t?—Zen Chic Inspired is a resource you’ll turn to again and again. Classic or country, modern or eclectic, Brigitte guides you toward creating one-of-a-kind quilts inspired by the colors and elements in your home. No difficult design concepts here—Brigitte’s approach is innovative, fun, and easy to start using right away. Don’t start another quilt for your home (or somebody else’s home) until you learn Brigitte’s techniques for making a perfect match! 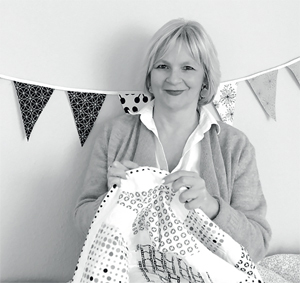 You’ll love Brigitte’s practical advice for dreaming up quilts that tell your story. And the styled room shots that inspired the 12 quilt patterns inside? Gorgeous—and a wonderful way to inspire your decorating too! We’re excited to have Brigitte as a guest writer at Stitch This! today—don’t miss the story she shares about helping transform her sister’s pillowcase from a project without a place to call home into a project ready for center stage. FABRIC GIVEAWAY! Our friends at Moda Fabrics gave us a bundle of Brigitte’s new fabric line, True Blue, to give away to you! 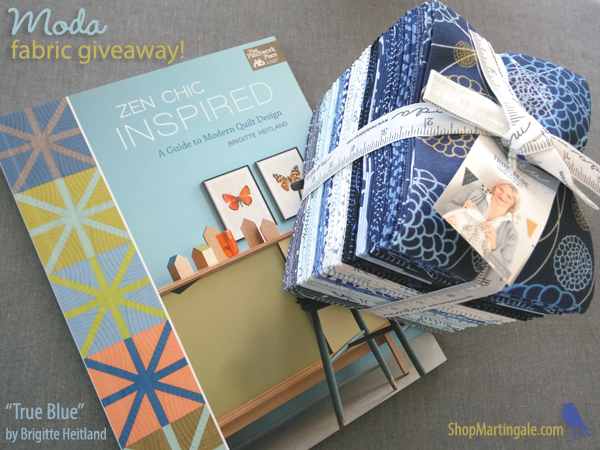 Learn how you can win this beautiful, bluesy bundle plus a copy of Zen Chic Inspired at the end of this post. I was excited because my sister was visiting from the United States. We hadn’t seen each other for some time, and there was a lot of catching up to do. She couldn’t wait to browse my fabric and see all of my creations. One of my fabric designs was based on newsprint, which she found especially intriguing. That’s when I decided to slow her down a bit. “What kind of pillowcase, and for what room?” I asked. It turned out that she hadn’t really thought that far. It’s a common scenario I often observe in quilt stores around the world. In fact, I remember having such reactions myself during my early days of quilting. We see a fabric, we fall in love with it, we buy it and we bring it home, and perhaps we even make a quilt, a pillowcase, or something else. And then at the end of our labor we proudly display our work, only to realize that we don’t experience the satisfaction that comes with a harmonious look. Idea from Zen Chic Inspired: turn a pixelated image of your space into a color palette. I explained to my sister something that I’ve learned along the way: sometimes it’s better to start the process backwards. Begin with that favorite Japanese lamp which is the focal point of your guest room, or the abstract painting in your studio. Have a look around a room and survey your favorite things. Now, with these items in mind, look again at the fabric you were going to purchase. Is it still a go? Idea from Zen Chic Inspired: transform the shapes or motifs in a room (such as a lamp, a cushion, or even a coffee cup) into a foundation for a show-stopping quilt. This approach to quilting, which includes some easy-to-understand principles of interior design, is just one of the many pleasures that await you in Zen Chic Inspired. I can’t wait to share with you what I shared with my sister, because it won’t only help you select a great project; it will help you select a project that will give you so much more than just another quilt. Example from Zen Chic Inspired: the fabrics in the top photo aren’t harmonious with the surroundings; in the bottom photo, the fabrics coordinate well with the elements in the room. Strips at unusual angles: Brigitte’s On the Ball quilt, inspired by the legs of a rocking chair. 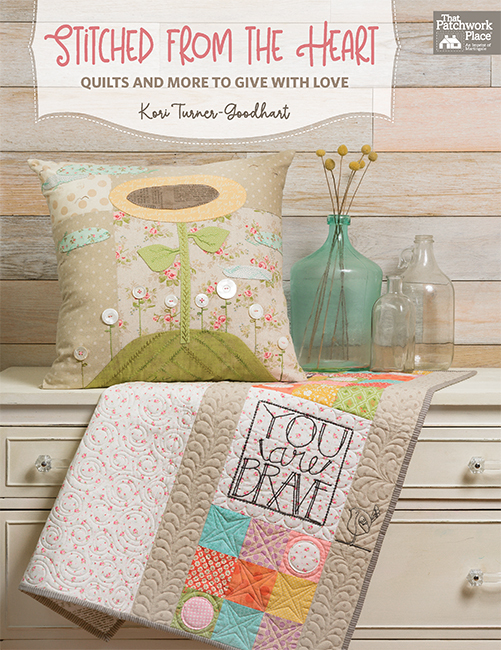 If you’re a passionate quilter, chances are you already have a collection of quilt books. But if you’re like me, you value high-end fabrics and want to make the best use of the time you invest in quilting. It makes sense to think a project through from beginning to end before you start. Once my sister did that, she realized that she would be better off using a different fabric. And the one she picked in the end was perfect. Through Zen Chic Inspired, I hope I get to be your little sister for a day, or for the duration of your project, or maybe even for your quilting life. Brigitte, thank you for sharing your story with us—you gave your sister a whole new perspective on quiltmaking! How do you typically start a new quilt project? a) I’m in tune with Zen Chic Inspired—before I begin a project, I like to gather inspiration from the space I want a quilt to live in. b) Sometimes I finish a project before I know where I’m going to use it, and it gets stashed away because it doesn’t quite fit in anywhere. c) I have a closetful of quilts that don’t have a home in my home! Share your answer in the comments and you could win Brigitte’s new True Blue bundle from Moda Fabrics plus a copy of Zen Chic Inspired! We’ll choose a random winner one week from today and let you know by email if you win. Good luck! We’ll email you about your prize, Shan—congratulations! A would best describe the one real quilt I have pieced for my sister. 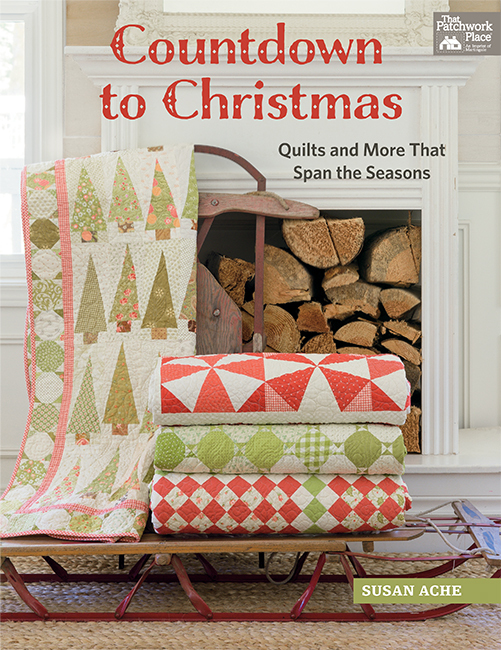 It is a Christmas quilt with fabrics picked to complement her home. However, I read every word and it sure makes sense to follow the book’s advice. Thanks for the suggestions. I fall in both the a & b area. If I’m making a quilt for a bedroom in our home, I’ll let the room inspire me. But sometimes, I make quilts just because I like to make them and see them. Sometimes they make an appearance when we have guests or need extra covers. Sometimes they find new homes, or are made for charitable causes. I love to make and create, so I just keep doing it. I’m in tune with Zen Chic Inspired—before I begin a project, I like to gather inspiration from the space I want a quilt to live in. I probably fall between b and c – but that’s only because I am in a smaller home since we’ve downsized and there are only so many quilts that can be out and used at one time. Otherwise my approach is very much eclectic, but that’s the way I roll. I have a perfect space for some Zen-Blues though. Definitely a) I’m in tune with Zen Chic Inspired—before I begin a project, I like to gather inspiration from the space I want a quilt to live in. 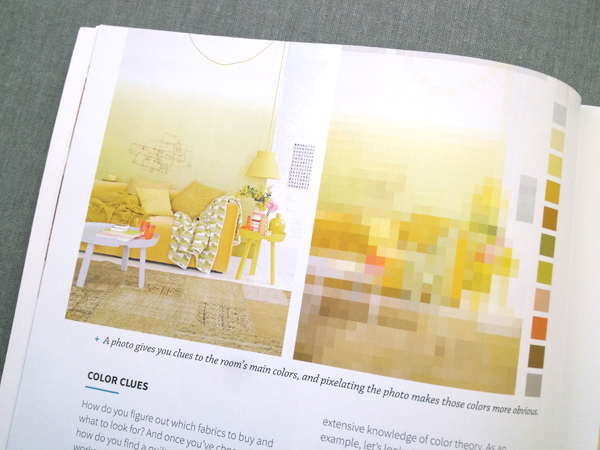 I am a cross of A and B. I love the pixelated room picture idea for developing a color palette. I do some a, some b. It’s just so hard to resist some of those perfectly gorgeous fabrics! I fall mostly in the "a" area because I sew with the colors I love in my house. Even my husband will say, "Those are your colors." He may not be able to describe it in words, but when he sees it, he knows. However, sometimes I like to expand and sew beyond my comfort zone and style of quilt. Often it makes a perfect gift. On the other hand, I have an eclectic array of quilts and that works well too. When I make a quilt I usually have some where for it to go so the colors usually work. Definitely B, but aspiring to be an A.
I find something I like and then make it and then it is stashed away because it doesn’t fit in anywhere. OMGosh – I’m so a (b)!! I’m always buying fabrics that I just love, take them home to my stash, then when looking for fabrics for a quilt…out I go to buy more ’cause what I have just doesn’t work for the quilt in mind! I have made a few quilts that don’t quite work – they always make a great gift or charity quilt! I have a closet full of quilt tops, not quilted yet. If they don’t find a home while i’m alive then auction time!!! I have a closet full of quilts. I make quilts that appeal to me not necessarily ones that match my home decor! Or else I think I have matched colors and then it just looks like a hodgepodge of fabric and not what I had intended…discouraging after all the hard work. My answer is A, but really the colors I love are in my home and in my quilts. If not my quilts are displayed and fit well with my eclectic approach anyway. My problem is wall space. I desperately need this book! No kidding! I have to answer "C". I have stacks of quilts in a spare bedroom made from fabrics I loved but that didn’t go with anything. I buy fabrics because I love them – not because they have a purpose or place. I’m trying to re-group, really. I definitely fall under the letter c! I’m a (c) and thought I was the only one. My home is very traditional, my taste in quilts is very modern and I can’t seem to blend the two. I need help! I also love real blue colors that go better with traditional furnishings. In fact I yearn for real blues, as the trend now is leaning more to aqua. Not quite sure which of these I fall under as I’ve yet to actually keep anything I’ve made!! Other than a couple of holiday items, everything I make is a gift for someone or a charity item! Maybe one day I’ll actually make something for me!! I am more of a "c" option. I love to put together fabrics and patterns. Sometimes as I am working on a quilt, I decide who will be the new owner. Most of the time, I am doing the creating because I want to try a technique or put together a specific pattern or colors. I love giving away quilts "just because". I feel like I am giving part of my heart. I am a little bit of all of these. Sometimes, my projects are tailor made for the space. Other times, I use fabric that I love but the result doesn’t always ‘fit’, so of course there are lovely quilts in my stash with no place to use them. I love the ZENCHIC approach! I would love to say that I’m in the "a" category, but according to the pile of the quilts I have sitting in the closet that haven’t seen the light of the day since I held them up and said I’m done………..I’m definitely "C"! My answer is mostly (a). I consider where I want to use the quilt when choosing my fabrics. I have quilts all over my sofas. I am always looking for new ideas to create them. Your Zenchic Designs are wonderful. Your ideas are like a breath of fresh air. I am definitely ready for a change from my country colours and your ideas seem to be exactly what I need. Thank you. I fall between a&b. I really just love to buy fabric and make it up as I go! Being a military family our space changes. Inspiration comes more from our location than our house. I think of not only the space but who it is for. And sometimes I make a quilt "just because!" I plan all my projects with the recipients’ favorite hues or decor in mind. I’ve only made a couple of quilts and they have their spots of honor in the bedroom and the living room. Definitely in tune with Zen Chic Inspired. Most of my quilts are gifts do I like to ensure the colors and style match the person and their home. I can sometimes be inspired by a fabric rather than a decorating interest. Hopefully I can share projects I have miscalculated the color or design. Since I am fairly new at quilting, I really appreciate this Zen information. Thanks for sharing! I never though about matching a quilt to the surroundings, but it makes sense. I would love to try it with the book. I have made and given away lots of quilts. I also have quilts on display in my home and some stashed in a closet. I hang quilts on a ladder made by my husband. I change them seasonally. I chang them for holidays. They all blend and make an artistc display in my home. The quilts made for the room, usually will host fabrics of the rooms colors. Love your book! I would say I am in the B category. But my quilts are usually not stashed away. I will always find a friend or family member who can use the quilt in their home and really enjoy it. At this point being a beginner/intermediate quilter, I would pick "b". However, I do tend to gravitate to colors in my home when selecting fabric for me. Most of the quilts I’ve made so far were gifts to family members as I honed my skills. Thanks for the chance to win! D) I design my quilts around the people who will use them, regardless of whether they will match the room or not (unless that is what the recipient wants)…but most of my quilts are either bed quilts (and thus, they are the focus of the room and set the tone) or lap quilts/couch quilts (and thus, get folded up when not in use, so not part of the decor). If I’m designing for a room, I do take the surroundings into consideration, so yes in that sense I’m an A), in tune with Zen Chic…but only when it matters. The book would be a huge help when I get stumped, though! B I make blue quilts because it’s my favorite color and my house is decorated with blue. I would love love to have that luscious fat quarter bundle!! hmmm 🙁 more b…I preordered the book, can’t wait to receive it . I decide on color first. since I am new at quilting, the first quilt didn’t work out and I don’t like the colors. this quilt I thought more about the tones of colors I always seem to wear and use in my home. hope this works out….just starting it. I usually make quilt that appeal to whom they are going to go to. Modern for modern people and vintage for those who loved vintage. For me it is whatever strikes my fancy. A quilt can be used anywhere if it is loved. I definitely fall into the ‘C’ category, and it looks like I could really use some Zen Chic Inspired advice. Quilts, quilts, quilts, of every style and color…I love quilting. If a design catches my eye, I just have to make it. I love the idea of actually starting from a purpose minded strategy. I love to quilt with bright colors but that is NOT the color scheme in my home so they never "fit". I’m relatively new to quilting- so I don’t fit into the suggested categories. I am doing some redesigning in my home and want to apply Jenny’s approach to choosing colors. The modern quilting trend is very appealing to me. I make quilts because they are beautiful and challenging and the sewing is relaxing and creative. I put my quilts where I want and the design works around them. I love eclectic so it all works together. I wouldn’t classify myself in any of those categories. Maybe I am too much of a beginner and have only made quilts from classes I have taken so haven’t given it that much thought. But I also think this goes against the other things I have read and heard about making a quilt. In her black and white example, where is the pop of color. I have mostly neutral color rooms and use colorful pillows or lap blankets to brighten them up. This way, I can change a whole room, just by changing out the colors of the "accessories" when I want without having to change the furniture or paint color. I am a cross between an A and a B. Somehow I am better at making quilts to fit other people’s homes! I’m in the B category; I tend to make a quilt because I like the fabrics and the quilt design and don’t think about how it goes with my house. I’m intrigued by the pixellating technique; I’d love to read about that. And blue is my favorite color, so I’d love to win those fabrics- and I’m sure I’d find a place for them in my house! I am a complete B. I need this book!!! The fabric just makes the quilt. Go or not, it’s here. I’m a mix. Some of my quilts work with the decor…some don’t. I think I should work on this. Zen Chic would be of great help! Thank you for the sweet giveaway. The book and the fabric look fabulous! I am a B for sure! I love this concept! Unfortunately I start projects with my own preferences and then try to find a home for them. I once did a beautiful quilt for my brother-in-law based on their "geranium" colored bedroom. I should have asked for a paint chip! The True Blue bundle looks gorgeous and I would love to see Brigitte’s tricks in Zen Chic Inspired. I would say b because i make a quilt fir a specific person or a specific room. Sometimes, I am just inspired by a collection. Looks like a book to buy! I am a ‘B’ and a ‘C’. I give away many of my quilts but do not have room for all those that I keep. When I give away a quilt I think of the person that will receive it and their personality and try to plan around that. When I do quilts for myself I choose the most beautiful colors that I can find. I try to buy fabric that compliment rooms in my house. Love the blues in the fat 1/4 bundle!! When I make a quilt I most often have a plan in mind. The colors I choose feed my soul or are those that would compliment the room where the quilt will live. My design is where I let my wimsey go. It’s so fun to see my end results. B. My finished quilts get stacked in a corner. They have to be easily accessible because everyone uses them. When my daughters have friends sleeping over, they each grab 2-3 quilts to sleep with. My niece recently requested a blue and white quilt and that fat quarter bundle would be perfect for her! I fall in love with a fabric line, buy several pieces of it and then wonder what to do with it. My home is a hodgepodge of colors and styles. I need help! Thanks for a chance to win! I just started quilted last year, so I am a newbie at this. Have sewn tho, for a long time. Was taught to sew by my great grandmother. I came across a Quilt she had started, and I want to finish it, so that was my inspiration. I generally pick fabric I like, and the ones, other than my grandmother’s, I have given away. Love the blue, would love to win it! And I definitely need the education of the book!!!! Lots of quilts stashed away that come visit in their season. Really like your idea and oooo ahhhh those blues. Would be fun to be lucky winner and stitch something fun as charity give-away project. Thanks for your amazing inspirations and will get busy NOW! Sadly….and happily….I’m a C !! I have an armoire full of quilts but I do rotate them monthly for display in my apartment. I like to make quilts that I have a place to display them, or as gifts. If for gifts, then I like to go with the decor where they will be. I’m A, because I do think beforehand where a quilt will end up. I actually wish I could lean more toward B as I am always afraid my quilts will end up being "matchy matchy". Would LOVE to win that fabric bundle!! Thanks. Really interesting! I do have some quilts that are tucked away because they don’t ‘fit’! When I make a quilt for someone, it’s well thought out as to what they would like or how I see and value them. But when I quilt for us, it’s whatever catches my imagination. And it all works marvellously, because our home is a mix of old and "new". No one style but a mix, as comfortable and welcoming as a favourite sweater – a true reflection of the seven personalities that reside there. Mostly, I do not care if the quilt will coordinate with a room’s decor. The decor of a home is often a compromise and not necessarily what I love. Since I quilt as an activity selfishly and do not need quilts for practical purposes, I make quilts that interest me from a pattern, fabric, or method standpoint. If they can be displayed, that is great; it is also all right if they are just fondled occasionally. That said, I have made a few quilts to specification for people for special occasions. I would say I’m a little of all three. My daughter will be moving to a Mid Century Modern home and I can see that this book would help me determine what I should make for her. She is also an Interior Designer and has a very strong point of view. She would love to view this book. Thanks for the interview and the giveaway opportunities. Love this approach. Because I decorate with antiques, most of my quilts are traditional in dark, muted colors. Would love to find a way to use some of the brighter fabrics on the market today. Like others have said, I design my quilts with a person in mind. I don’t know where they are going to use it. Sometimes I make a quilt for a room, and then I do take the surroundings into consideration. Most definitely C!! As a quilt teacher, many of my quilts are class samples that were meant to sell the class and the fabrics in the store. If I make a quilt for me, the fabric choices are based on the room, not what strikes my fancy at the moment. Funny, though… when I replaced a brown couch with a blue one, I was thrilled that I could start using a yellow, blue and white quilt that I made years ago. It looks great on my new couch! If the quilt is going in my home somewhere I design around a.) Zen Chic where I gather my inspiration around what is in the space. 99% of my quilts, though, are a a different category that another reader has described as D.) they are the colors of the space of the person I am making the quilt for. I have made one quilt top for my husband out of fabrics that he bought on his worldwide travels and brought home to me that I have to think a little harder on where to put it,but I imagine it will go nicely anywhere as it has an immense amount of color in it. when i make a quilt that doesn’t fit in, i donate it for auction or give it to someone whose style it does fit. love all the gorgeous blues. I am more of a "B", I fall in love with certain fabrics and when completed the quilt doesn’t always fit. I gather up all my "don’t really love that" quilts and let my neighbors choose which one they want for each Christmas. I am learning to be a little more discerning when choosing fabric, most of the colors I love are in my home. I guess I’m "d" – I make what I like & don’t care if it goes with my decor. My favorite quote is "Good art won’t match your sofa." But I really like her designs and LOVE the fabric! I guess I’m mostly an A but sometimes when I see fabric that I love, I just have to have it. If the quilt doesn’t work out for my home I know lots of people who would like to have it. Blue is one of my favourite colors and that bundle looks wonderful. Zen Chic looks inspiring. I am not a, b or c. I make it because I like it. It will find a happy home even if I have to reconfigure other things in that room. LOVE the True Blue fabric line! I am pretty much an A with some B. I usually fall in love with a pattern then use the colors in my room to create it. I don’t really plan on where it will go (with the exception of bed quilts). I can always find a place for the completed quilt. I am mostly an A. I try to make quilts that fit my décor and use fabrics I love. I have made Halloween, Christmas and seasonal quilts that match my décor. Very few of them don’t "match", but blend well enough that they are ok. I think this book is awesome! Totally reinforces what I’ve been trying to do. You can have your home quilt happy! My answer is B. I start a quilt and see where it can fit, but blue is my favorite color. My whole house is blue. I think I have giving my sons a blue-complex! This is so pretty, I like to win it. Unfortunately, I am a C–I need help! True Blue looks wonderful, as does the book! Definitely (b) I fall in love with a particular fabric or design, make something then realise it doesn’t go. The book sounds like a different way to think – just what I need. Oh how I love this fabric! To win this book would be a new adventure for me, as Ives never done any quilt like them. Thanks for a chance to win! Though I am a little of all three, I would say I am more a). I try to think where I plan to use my quilts first. Then I start! Probably 90% of the items I have made or either for gifts or donations to charities. So I usually buy the fabric for my stash and then make my items from there. Can I say D – None of the above. I make what makes me happy and once it is made determine the home for it. It could be my home or someone else’s. In my living room I have a curtain rod with clips on the wall above my couch and change the look of the room depending on what quilt is hung. Everything from How the Grinch Stole Christmas to earth tone traditional to crazy quilt batik to scrappy. Honestly I’ve only recently wised up to the Zen Chic approach. So hopefully I’ll have less B and C in the future! Has to be B. However, friends are very appreciative of a gifted quilt. Living in small quarters, I usually do more wall hangings than quilts and I try to use the "A" approach but I was very inspired by the review of this interesting theory of Brigitte Heltland. Then seeing that wonderful bundle of ‘True Blue’ really got the creative juices flowing as I love the color of blue. This prize would be so fun to delve into. I’d say, "b) Sometimes I finish a project before I know where I’m going to use it, and it gets stashed away because it doesn’t quite fit in anywhere." fits me pretty well. I quite often make something that catches my eye, but I have no place to put it, or person in mind to gift it to. I’m definitely the one who falls in love with a fabric line. I make a quilt from it but then don’t know what to do with it. Bah humbug. Sounds familiar, huh. I have a closetful of quilts that don’t have a home in my home! I definitely am this person! B probably. I’m fairly new to quilting and my home is a Mish mash of everything anyway. Most of the quilts are made for family, and lots of charity donations. But I would love to open up a linen closet to see a stack of beautiful quilts! I decorate my house for each holiday or season. My living room is pretty neutral (wood tones) with touches of tomato red. I find most quilts will go with this scheme, except pastels. Those are reserved for the bedrooms. If something just doesn’t fit, I gift it to someone else. This way I can make a quilt according to the fabrics on hand and it always finds a home. All three! I am pretty consistent with what I make and gift what doesn’t work (but I wanted to make) to others. Love their patterns and look forward to the book! Quite frankly, I make quilts scrappy so I am not tied into fitting them in a specific spot. I start piecing and let the quilt "speak" to me. I am intrigued by this Zen Chic approach and will be considering it for my next project. D) My house is very neutral so the quilts are the star of the room the more the better! I would have to answer B. Occasionally, if it is a gift for someone, then I would consider that person, and what I know about their likes and dislikes. This article will make me think more about what is going to happen to said quilt! I have made quilts that were perfect for the spot and they looked beautiful. Sometimes I have made a quilt just because I like the design or fabric and just wanted to make it. I give most away, a few ended up as charity, but I have a few that are in the closet too. I do a mix of both. There are times when I shop specifically with a scheme in mind, but there are times I decide I NEED a certain fabric and then try to findicate a way to make it work. I’m probably an A and a B….I love fabric, all colors! Any ideas are always appreciated. Today is my birthday so the giveaway would be nice! I typically try to at least match color palettes when beginning a project. I have taken a picture of a room and close-ups of colorful items in it prior to designing and purchasing material. My answer would be B. The book as well as the patterns within the book look great. Most of my projects have a home before I begin them. Thanks for the give-a-way! I start every project with inspiration from my home. My style is very eclectic, a bit of a gypsy inspired. LOVE the pixalated photo advice. I guess I’m not so in tune! Actually, I buy vintage quilts and unfinished tops to decorate my space, the few I’ve made for myself are seasonal and are table toppers and runners mostly, and I have a collection of sentimental fabrics from family to make myself a lap quilt (whenever!) I make for gifts almost exclusively, and if I can get clues about colors beforehand well and good, otherwise that new baby gets my impression of their parents! lately, that’s been old patterns I love with new fabric styles and colors. I love the On the Ball quilt, it’s very Japanese in feeling. My space is in blue and white, with vintage china plates and Japanese blue and white I collected when we were stationed there, and the blues in her fat quarter collection are yummy! Time I made something for myself?? Most of my quilts are made for someone else and so have a color or theme in mind. The ones for my home usually are for a specific room and, as such, already have a color scheme picked out. Reading about ‘Zen Chic Inspired’ has inspired me to think differently when auditioning fabrics. Currently, I do have quilts stashed that don’t fit with the colours or decor of my home. Looking forward to reading Brigitte’s beautiful new book. Overall, I feel I am a B, usually seeing a quilt and using similar colors to create and finish that quilt. Although most of my quilts are given away to those that have requested them or could "use/cherish" them for some reason, I aspire to the Zen Chic method that would no doubt enable me to use it in the room desired. I have never really looked at the shapes of the objects in the room, which is an awesome concept! I feel I could use the book Zen Chic to help me achieve the goal of every quilt having a spot in the house; also, blue and white is my favorite combo of colors. The book could help me to determine which room would be best for my quilt, as I have blues throughout my home and how to figure out the best shapes to incorporate into my quilt. Thank you such an interesting topic!!!! :). Love it!!!!! (b) is probably the best description for me. This looks like a great book and the fabrics look lovely! I thought I did pretty good in matching until I viewed this. WOW! What ideas it gave me. I love Moda fabrics and would love to win this. I already have ideas for it’s use. Thank you! I’m none of the above. I use quilts a a way to enjoy my efforts and display them for their own merit. I also like to change them to reflect the seasons. The pixelated photo is a new tool I will have to try. Usually my quilts are inspired by the beautiful fabrics I find. My house is eclectic and I have a couple spaces where I hang quilts. I periodically rotate the quilts from my stash so it is almost like an art gallery. What a great book idea, as I am sure we all have quilts in our closets that just don’t go with the surroundings…. I make a lot of gift quilts for family and charity quilts. I have a lot of blue/white in my home along with Danish Porcelain dishes in blue/white. I would love this set of blues and whites in this fat quarter bundle …. I usually know where my quilts are going when I start them, but sometimes fabric or a pattern grab you for a look or a technique that you just have to challenge yourself to make. That’s how I’ve gotten into making more ‘modern’ style quilts and I am loving that look. My answer would be B. Although I try to pick out colours that will coordinate in spaces, I’ll often end up picking up a fabric or a quilt kit (I’m still new to quilting and need the guidance of a kit) because it’s pretty! That blue bundle would actually be perfect in my home! 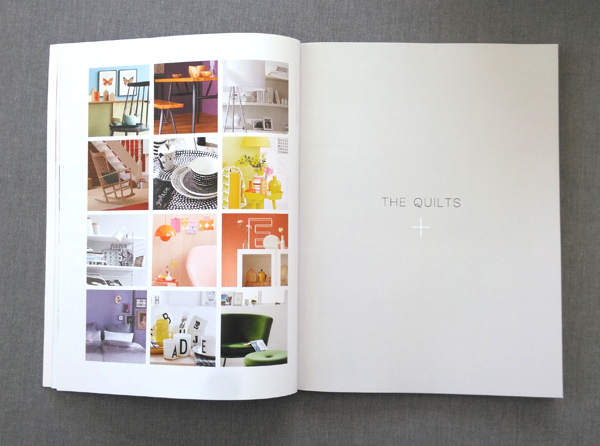 This books looks very interesting to me, as I too have quilts stashed that don’t really compliment my home. I do love the fabric shown though as blue is my colour💕. I’ve made quilts for my home but now I make more scrappy quilts for gifts and charities. I suppose I’m more a combination of your choices, mostly a and b. I do tend to check out the area as best I can, but often do make some quilts based on the fabrics or pattern style. Brigit’s ideas are really good and I plan on consciously using them even more. What an amazing giveaway. Thanks! I’m definitely a "b" quilter. I pick the fabric that speaks to me & make the quilt but if I’m not giving it to a particular person, the quilt top often gets put away because it just doesn’t go with anything in our home. I am in category B. I make quilts because I like them. I do not always have a plan for where they will specifically land. I am pretty much the "B" type. Although it is not sometimes but more a lot of the time. I just make what appeals to me and don’t really worry about where it will go. OK, maybe I’m a lot type "C". A would be the closest response. I certainly don’t have a closet full of quilts or even one that I don’t use. Charity quilting allows me to do small quilts that don’t fit my color scheme, but were a pattern and color that I just felt I had to do. I’m between A and B. Sometimes I have a plan for a quilt, and make it to fit the room. Otherwise, I just buy fabric I think is pretty, and decide what to do with it later. If I have to pick one, I would say (b). My quilts are based on fabrics I love and then I pick a pattern that I think would be fun to make. And sometimes it’s the other way around, pattern first and then fabric. I’m in the middle. I fall in love with fabric and then have to hunt for a pattern that will show it off. Usually, I am disappointed because I have no "vision." I will have to try the Zen Chic approach. Thankfully, since I have only been quilting 2 1/2 years, I don’t yet have closets full of unused quilts. I fall into the c for sure but that’s OK. Eventually they all find a home and I make more. I ❤️ UNIQUE . I’m new at Quilting. I make most quilts because I like the colors and don’t worry about a home for them, but am currently working on a wall hanging specifically for a spot in my front t room. I prefer to figure out the color scheme matching the dominant fabric in contrast or in harmony with the room. Secondary fabrics in the quilt harmonize or contrast with the main fabric to give the quilt a bit of sparkle. I love quilts and I love color. I make a design that appeals to me in the colors that seem right at the time. The quilts all find a home eventually. Blue is my favorite color. I am not in tune but I can see the new book would be very interesting and help immensely with my next project! I’m a little of all of those. If I’m making a quilt for someone else, it will match their space. I have a decent size stash because I buy what I love and that fabric is just waiting for the right pattern. And, I have quilt tops, wall hangings, table runners (or toppers) that are seasonal or holiday inspired. I guess I’m the kind of quilter who falls in love with fabric and don’t give much thought where the quilt will live. I have quilts all over my little house and none of them really go with my SouthWest decor. But I really don’t care I love looking at, snuggling with and just having them around. Do not have a blue quilt and the give away fabric is lushes. I make quilts for a specific room or purpose so in a way my answer would be A. I would love to win the book and fabric so thank you for the opportunity! Since my home is decorated in the colours I love, most of my quilts have a home here, if they are mine to keep. Sometimes I go out of my comfort zone in color and those quilts have a bit more difficult time fitting in. I guess you could say I’m basically a c, have a closet full of quilts that really don’t go with my house but I use them anyway! I love your new line in blues, that would totally go in my bedroom! And just about anywhere else in my house. Have lots of blues, my husbands favorite color. I do have quilts that do go, i.e. my son’s room is red/gray/white and he has lots of red/black/white quilts. I do like to spice things up with bright colors sometimes especially on gray, rainy days. I am a mix between a and b. Many of my quilts are gifted and though I do not necessarily consider the location for the quilt, I do spend that kind of time and energy thinking of the person I am gifting and match the quilt to that person. You have inspired me to spend an equal amount of energy thinking about the actual location and will appreciate the help your new book gives me. I am b all the way, sometimes I fall in love with a pattern & just have to make it! I guess I’m a little bit all three of those choices and that’s ok with me. I have some quilts I’ve made to fit particular color or style schemes, whether in my house or for gifts. Some of those quilts have gotten stashed away because my style changed and I changed the look of the room. I still love the quilts, though. And sometimes I just see a pattern or palette I love at the quilt shop and go for it without regard to where it’s going to go. Once or twice in that situation, I’ve even changed a look in a room because I wanted to design around the quilt. Kind of like buying the shoes first and then buying an outfit to go with them! I’d have to go with B, though I’ll use a quilt even if it isn’t a perfect match. Most of the quilts I do are because I love the patterns and the fabrics used in the instructions. The miscellaneous quilts I end up with are those from classes trying to learn a new technique. Winning these fabrics would get me out of my box!! I think I need that. I am all over the place. I like to learn different technics and so start with that. I have quite a few that are packed away. I love wall hangings and those can be changed out seasonally. I also like to keep a theme so it ties in with different rooms. I love small projects like table runners and place mats and napkins that match my eclectic decor. I feel quilting is an art and really try to make them special. I also love quirky wall hangings that can bring a smile and maybe a laugh. I tend to make small seasonal quilts and gifted quilts. I have a fireplace where I hang seasonal quilts. I actually don’t hang a lot of my quilts which I am going to change because looking at them makes me happy. I have to say my very first quilt, which is blue does hang on my wall. Blue happens to be my favorite color. I’m between A and B, but my home is very eclectic and I can usually use most quilts that I make. I have a friend who’s is always telling me "Oh, that won’t go in my home", but I can always find a place that it fit’s for me. It’s also fun to make something I wouldn’t usually do and give it away as a gift! 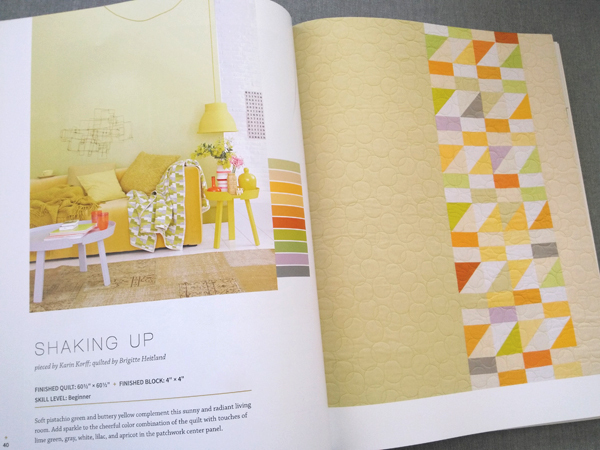 Love the patterns in this book … and the fabrics!! I usually know where I am going to use the quilt before I finish it. Thank you for the giveaway opportunity. I make a quilt and then, decide where it will go. Sometimes, to someone else! Well, I’m a solid (b). Sometimes it works; sometimes it doesn’t. Will try the pixelated photo idea! Meanwhile, I love the True Blue fabric. Thanks for the chance to win it. I think I’m a "B" person. I make quilts cause I like the technique, something I want to learn, etc. when I’m done is when I figure out what to do with it! Since most of the quilts I make are for babies or young children, I like to make them colorful and fun. Input from the intended recipient is always helpful. If I had to fit in a category, I guess it would be B. While my home projects usually have a place and palette in mind; I do buy too many fabrics that don’t seem to have a good place in my style. Need that book to set me straight! My answer is none of these. I see a pattern and fabric I like and go fo it. I don’t make quilts to decorate my home. I’m usually making a baby quilt or a quilt for charity just to keep my hands busy. I have a wall in the dining where I hang my quilts but they don’t have to match my decor, well, actually, there’s not much decor in the room anyway. Thanks for the chance to win the fabric and the book. Not quite a closet full of quilts, but a bin full of quilt tops that need to be finished. Someday, I’ll retire and finish them — or maybe I’ll just make more tops and leave them to my daughters to finish when I’m gone. I’m an A – As I do try to gather inspiration from the room/home that the quilt is meant for. Although sometimes it is difficult to do so when it is meant as a gift, for someone that lives far away. BTW – I have a perfect place in mind for a quilt made with your yummy blue bundle of fabric. I would have to say B. Unfortunately, I fall into the "love the fabric, now I’ll make a quilt" category and don’t always have a home for it when I finish. I need another choice – "None of the Above." My quilts are very eclectic, some very modern and some very traditional. I live in an old house and don’t worry about where my quilts fit in. I just use them and give them to others to use and love. Things don’t have to match to look nice and bring happiness. I guess I would say A. I make mostly small quilts to hang. I’ve heard if you choose what you like, it will somehow work together. HELLO from Montana! "a" fits me! Inspiration seems to come from the needs of the receipent. Love doing Charity Quilts! Thanks for sharing! Most of the time I see a fabric that speaks to me, so I pull together fabrics from my stash that go with it. Other times it is a quilt design that draws me to it and I go find fabrics for it. A lot of the time my quilts are gifts, so I try to get some ideas from the person it is for, have taken photos of their room it is for. This book has some great ideas and I will incorporate them into future projects. I would say I am an A. I usually have a place in mind for most quilt projects, but sometimes inspiration takes hold and I’ll just make what I need to make, regardless of whether or not it fits into my decor. My quilts get rotated around every few months, to keep our home looking fresh and seasonal. I don’t look to match the quilt to the area it will be used in. I match the quilt to the person it’s going to be given to. Then it always matches and always fits their space. For example, I recently started a few baby quilts – I have no idea the theme or style (or gender frankly), but I know the quilts will fit into the area, because I chose the fabric based on what I know about the parents. Same with a wedding quilt I’m making – it will fit into their space, because the fabrics speak about them. I have a tendency to start over zealous quilt projects, then lose interest if a project takes too long to finish. But, on the upside, my fabric color choices have been pretty consistent over the years, so my quilts fit right in with my décor. My only change is for a requested quilt, which can be any color scheme. B is me for sure! I’m loving the Zen Chic approach…exciting stuff! I usually choose design and colors I like, so definitely B, I finish a quilt before I know what to do with it. I am a C. I have stacks of quilts that I can probably call "color studies" that wouldn’t go in anyone’s home! The problem is that my home is pretty subdued–beiges, rusts, browns, blacks…but I like to play with purples, turquoises, and blues. Not sure what to do about that! Perhaps this book will have some suggestions. Guess I am more of a B person. The FINISHED quilts I have are folded and put away, as I live in SoCal and in past years it has been too warm to use quilts. With the rain and cooler weather this year, I have used them more than in the last 5 years. Doesn’t stop me from making them though! B. Often make a quilt and when I complete it I find it’s not quite right for my space. Could use some inspiration. I would say mostly A. I tend to pick colors that go with what is already in my house. All three categories apply to me, as I make a lot of quilts! B is probably the most frequent place that my quilts start. I’m a b for sure. I fall in love with a fabric and make a quilt. Sometimes it fits into the ascetic of my home, but if not I use it anyway! It takes me so long to make a quilt that even if it was planned to go somewhere specific in my house by the time I finish it I’ve changed my house. I start a quilt because I get excited about a new pattern or pre-cut fabric line. I keep my surroundings neutral so I can add pops of color in my quilts. A & B for me – if making for someone else I do my research – what/where questions posed to recipient and i love to visiti their home if possible. Sometime though, I’m just inspired to create and let that be my guide – confident that there is always a home for a quilt! b) I make quilts that I love and then have no place to put them. I love Zen Chic. I usually know where a quilt will go when I start it but I also make scrappy quilts or a new pattern I want to try as charity quilts. Sometimes I finish a project before I know where I’m going to use it, and it gets stashed away because it doesn’t quite fit in anywhere. I am so random about starting quilts it’s not funny. I may see a pattern in a magazine or book, a group of fabrics that catch my eye or a quilt at a guild show and tell that gets me hep to try it. So I am definitely in the "c" group with a closet full of an assorted range of quilts that I truly love but that may not go in my house. Luckily I have a lot of nieces and nephews who still seem to enjoy getting them. I would say answer B. Sometimes I plan a quilt for a specific room other times I just buy fabric I love and hope for the best. Her approach seems like a great idea! I’m a "b". I usually start a quilt just because I like it and like the fabric, or I have someone in mind who will love it. So far, all my quilts have found a home somewhere, whether it’s in my home or someone else’s. I’m drawn to vibrant fabric colors and pattern, and am ok if they aren’t all ‘matchy’ with their surroundings. I like the quilts in the book. They look peaceful and easy to live with. I think I’m closer to B). I want to make a quilt because I think it’s pretty, not really having an end use/recipient in mind. Since a quilt is a moveable work of art, so it should be enjoyed by itself and not really compared to the space it’s put in. I am a ‘C’. Lots of quilts with no home. I would love to be in the Zen. It would help me on my impulse purchases. I’m more of a C. I tend to make quilts with a pattern I like or a fabric line that catches my eye rather than thinking ahead about where I can use them. 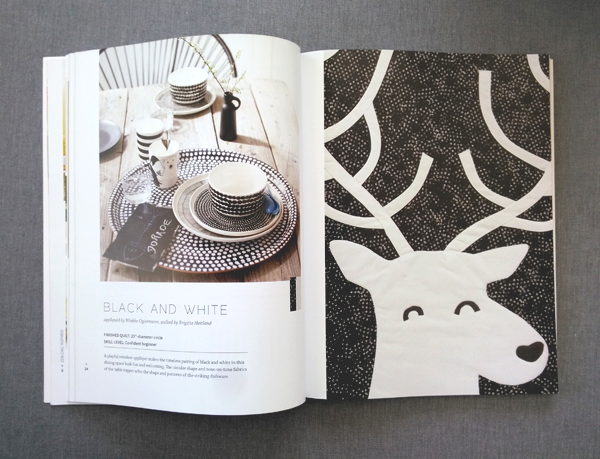 The ZenChic Inspired book looks very interesting and beautifully illustrated. My home is mostly neutrals, so I can change up for any style or mood! I don’t know what I am! I usually just choose by color or what would look good for holiday projects. I fall into a and b: some days with planing how and where it fits. And other projects are just started because I like them! Thanks so much! I would say I’m a touch of "b" with a big dose of "d". I don’t really care about matching/decorating. I find material that I love and go from there. And I’m loving the blue fat quarter collection! When I find a fabric I just love, it tugs at my heart and I can get many inspirations of what I want to do with it. Then off to find coordinating fabrics and off I go into my own special dreamland, not knowing what it will be like in the end, but it is generally beautiful. I begin a quilt with "research". That is, I look through a few of my quilting books and magazines for a pattern which is interesting to me. Then, it is off to the stash to pick fabric and begin the process. Some of my quilts go with the decor, some of them are the decor, some becme the dog bed. I love all of my quilts! My home decor should match my quilts! I often finish a project before I know where I’m going to use it. Many quilts I make are gifts for others. I typically start a quilt with fabrics in colors I love. These colors generally fit into any room in my house because I also use those colors in my house. I use cozy warm colors. I also have a large quilt rack that will holds 8-16 quilts, in my living room with all different colored quilts on it. It adds color to the room and that extra spark of art. I love your idea for this book and the blue fabric. I pick choice D……I do sometimes match quilts to what someone wants, but all my quilts get used, regardless of if they are matchy matchy. I like the eclectic look. Maybe I could use more Zen information! The book looks lovely, and the pixelated….or squint……idea is good. Most of my quilts are made with someone in mind, so I try to keep a color in mind for that person. I do like to use colors to coordinate with my home but try to use new quilting patterns. My two favorite colors are the blues posted today and aside from blue a soft sage. Most other colors may be added to these two colors for a wide variety of quilt patterns. Do like the Zen concept. I am totally in tune with the space in which I (or somebody I love) will use the quilt!! The blue bundle is beautiful!! I usually give the quilts I make away as gifts .. and try to ask the recipient in advance what colors they would like. I found the tips useful . Thanks for sharing so much of the book. b) but I always enjoy the process. I rarely have a purpose for quilts I make, usually just excited about the cool pattern, colors or prints I want to try, or classes to learn a new technique. I am very intrigued by the Zen approach. Thank you for a great idea and I would love to own the book. So unique!! I’m pretty much an A–try to match the space. Unfortunately, most of the spaces I’d like to match are hundreds of miles away at my kids’ homes. It’s hard to surprise them unless I visit and secretly take photos. I guess I’d better give up surprising them 😉 Love the look of this new book and fabrics. a- or b+ somewhere in between…I like certain colors for the home but could do better coordinating the items for better styling. Definitely A. The fabrics I’m drawn to are the colors I use in my home. Every room is a little different, so I have many color palettes to work with. And if i find a fabric line that doesn’t match any room, it might just be a redecorating opportunity. C for me. I see fabrics that I like, then go from there. I like your approach immensely. I love the "On The Ball" idea. I can’t wait to see how it is done. I use many of my quilts and I have a collection of quilts to give as presents. Sometimes, they go and sometimes they don’t. The correct answer is of course 1.
and than start thinking of a modern quilt for my home. I love all styles of quilts! I guess I fit into B the best. I tend to like more traditional styles in winter….and bright and anything goes in spring and summer! I purposely have neutral rooms so I can enjoy different styles. I have kept my home fairly clear of colour, and use the quilts, whatever they may be as the colour in the room. I’ve got a neutral wall colouring, wood floors and off white furniture. This works, but the quilt is always the focus in the room, and usually fairly bright. It might be better for me to try to have the room reflect my tastes more, and then match the quilt to the room. I’m a mix of A and B. I make some quilts without thinking of where they will go and what they will go with. Other quilts are perfect for their environment! I am a strong C. I make a quilt based on my mood. Sometimes it’s batiks, next time it will civil war fabrics, next time it will be 30’s, or Blue and white to match my bedroom or Red and white for a vintage look. Since I have a very playful cat I do not put quilts on my bed but I do drape them over the headboard and footboard to add color. I have also loaned quilts to friends to use for open houses or to put on beds in guest rooms. Hmmm I think I’m in the b category, I tend to just pick the fabric I like at the time and then panic later when I realise it won’t match any where! I think I fit all three categories. Sometimes I have a particular space in mind. If I’m making something as a gift I use colors liked by the recipient. I have a pile of quilts that I occasionally rotate on beds or walls. Some things I make just because I want to. For me it’s not so much about the end result as it is about the creative process. I’m a B or C. I usually make quilts in jewel tones because that’s what my eyes tend to see when I look at fabric or kits. Thus, I have a closet full of quilts without a home. Thanks! Most (A) — I have a purpose and a theme or color family in mind before I start. But, there is a little of (B) in my habits, too. opportunity to win it ! Great advice. Too bad I only heeded it once — choosing fabrics to match my family room to make a quilt for my husband )which I still need to quilt!). Other than that, I usually have a recipient in mind before I start a quilt. I like the inspiration of the book. I’ve been quilting for 10 years, but only have 1 in my home that I’ve made. Next on the list is a quilt for my guest room — which the give away blue fabrics would be perfect for. Thanks for the chance to win. I love color, so I have neutral decor in my home so I can change out my quilts depending on the season, and match the accessories as well. Great book! Thanks for sharing the giveaway. Well, none of those actually fit me…(A) comes the closest…as every quilt somehow finds a place in my home or it’s going to someone else’s home. Love the fabrics and quilts in this blog. I have very eclectic tastes and really just make quilts because the whole process soothes my soul! Most of my quilts are given to family and friends so I do try and use colours that they prefer. What great inspiration! We moved from a country inspired log home to our now city home and the quilts sit in a pile, no longer a ‘fit’ for this present home. Must follow your lead and make some new ones. I am a beginner. I have only made two baby quilts so far. I need to build my stash and I have lots to learn. Thanks for the chance to win. I make quilts for the experience of trying new techniques. Often, I have not idea if I have enough of a specific fabric. My best quilts are because I ran out of something and was forced to get creative. I use them all! Looks like a very useful book & the fabric is beautiful! I think I fall into all 3 categories. Sometimes I make a quilt for a specific room/purpose, other times it is just about the process of making the quilt and enjoying the lovely fabrics. Lately I’ve been drawn to blue, but I don’t have any blue in my home. I guess my daughter will be getting those projects! I usually fall in love with a fabric or a pattern and go from there. A very free spirit when it comes to quilting. I’m between A and B. It really depends on the project. Sometimes I am inspired by the colors or the fabrics and I just have to have it and then I realize afterwards that it really doesn’t fit in my decorating color scheme or style. Oh well! My house is full of quilts that don’t fit into my home. Your new method seems worth a try. Thanks. I’m a mix of all and of none-of-the-above. Occasionally I make a quilt designed and destined for a particular person and place and reflecting the appropriate colors and style. More often, however, I am inspired by the fabric and the quilt evolves as I make it. As with the afghans I crochet or knit, when I make a quilt not initially intended for someone, I open my mind to the people in my life, and watch "who comes to visit" while I’m working on the quilt. By the time the quilt is done I know who it’s for, and the colors and style are perfect for the intended recipient. Even when it’s a donation quilt for an unknown person I at least know which group or organization will receive it by the time it is completed. My answer is C. I just make things I like and never think about where they will go! I usually go by my quilting a quilt with the person I am making the quilt for. I do not usually go by anything or furniture in the house. a. fits me the best because I always want my quilts to look like they belong in their space. I’m much like many quilters! c) I have a closetful of quilts that don’t have a home in my home! – I buy fabrics on impulse, buy fabrics of a certain line and from other designers….then make quilts from their patterns in colors I would normally not choose. So the cabinet keeps getting more full, the line closet is full….of quilts I’m not displaying with true happiness. I am a mix of A and C. It seems I make one that I have no place for, but I love the fabric. Then the next one I make for a place in my home. I’m a mix of a and b. I sometimes make a quilt without knowing where it will go, but I always find either the perfect spot for it or the perfect person to give it too. I research the color palette for the intended recipient before stitching. I thank you for the give away and would love to win the "blues". Would love to make one of these quilts with Zen fabrics. I do like modern or contemporary quilts but have only made one baby quilt so far. My answer is A and B. Some times I am inspired by the space my quilt will be used and some times I just like to make a quilt that pleases me. I buy what I want to work with but usually have someone in mind as a recepient. I do think about whether the finished item would look good in a specific room, or if a gift..the other home, nursery, etc. always trying to keep in mind the existing theme. I never really thought about calling it a reverse process but I tend to work backwards more and more of the time. Thanks! I guess it is inspiration. I like to try new patterns and work from there. many of my quilts are presents but I try to match them to the recipient. for example my cousin’s favorite color is brown which is not me. but made quilt in browns for here PS, I did like it when I finished but would not have ever started it myself. I have never looked at a quilt pattern and or fabric in relation to my home or a specific room. Interesting. I’m more of an "A". I’ve given away all the quilts I’ve made and their owners place, type, and use went into their design and fabric choices. The 1930’s fabric style person won’t enjoy or use a quilt meant for the B/W minimalist. They might say thank you for the gift but I want my gifts to be used not stuck in their closet. I am definitely a C! I see a quilt I love, just have to make it. I do have a few made ahead but have been glad since I had gifts ready when needed without all the stress of hushing to get them done. I get to enjoy the process more this way! My new projects are generally the result of an invitation to a party of some sort, or a charity event that needs a donation. I have 2 that are in process right now, and a third on the way, for just such reasons. I often need to quilt samples for teaching in colors other than those in my home, so I am intrigued by the ideas in the book. My home is in the arts and crafts style which is harder to match! I am interested in the large pixels in the photo. Does the author tell how to achieve them, in order to more easily pick out the colors?? I usually start a quilt because I like the design, and somewhere along the way it comes to my mind who will be the recipient. I give a lot of my quilts away. I love those blues. My favorite color! Maybe I would make a quilt just for me, this time. I have a closet full of quilts that don’t have a home! I decide on a quilt several different ways…sometimes the fabric will dictate a design. Sometimes I fall for a quilt block and see certain colors. I don’t care if the color doesn’t go with a room, I take it with me to where ever I am sitting. The comfort of a quilt fits in every room. I get inspiration from everywhere. I make quilts for the joy of it and also make them for specific place and mostly special people in my life. I do have lots of quilts in my home that I have made at one time or other that don’t fit my decor right now but I still love them and they may fit in at sometime down the road! I start with a color palette in mind, but consider myself a color-junkie and usually end up with something totally different. Your Zen Chic methods may help keep me better focused. Zen CHic inspired I am….my projects are often inspired by someone special to me and I envision that quilt or runner, pillows etc living in their home. A) or I don’t care if it matches, I make it because I want to. I try to make projects that fit in the home they will be. Once in a while I do something quite random just because I like it. I try to shop my stash for a co-ordinating color palette, a pattern from my to-o list and go for it! If it doesn’t suit my aesthetic I give it away to someone who loves it! Actually, my home has neutral color palette and most things I make fit in just fine! There’s a bit of red in the carpet border, but red is a neutral, Freddie Moran says so! Wall hangings are a problem but more because we eliminated a bunch of walls. I am quite fond of blues and your stack of blues are wonderful. I would have to say "B". I Sometimes don’t have a specific "place" in mind for a pattern I come across or purchase. I see something I love and then I make it, Sometimes once it’s completed a project will speak to me and I know where it’s home is. Or maybe who it will be home with. B and C. I make quilts for thee joy and pleasure it brings me. My home fits around my quilting, not my quilts around my home. I always start with a color pallete, after questioning the person I" quilting for what their home’s colors are. I also love batiks, so use lots of those. I usually have a reason to start a quilt so already know what it’s going to be used for. But if I see some lovely fabric I just can’t stop myself making a quilt….. and decide later where I am going to use it. Thanks for the giveaway. a. for sure! I gather inspiration first, then dig in! I need to have that "purpose" in mind as I make something. It helps me reach the finish line! I’m one that sometimes finishes a project before I know where I’m going to use it, hence, I either give it away or it gets put in a donation reserve. I think that I need to consider Zen Chic Inspired before starting my next project – looks like some valuable information. I almost never have a specific place in mind for my quilts. I change things up quite abit and eventually they fit. Most of mine have inspiration from my home or nature so they fit right in…The only time I get a little concerned is when they are gifts. Then I say a few prayers. I haven’t made many quilts yet. However, I have accumulated a prodigious stash – much of which was bought on impulse! I so need to get a copy of this Zen Chic Inspired book! The concept you shared from this book would really help me avoid some pit-falls. Thanks for the awesome giveaway opportunity! BTY… I love Brigitte’s fabrics and style. I even have one of her quilt patterns ready to start cutting & piecing. I’m a partly B. Since I have given away as gifts or mission projects most of the quilts I’ve made, I only have 3 that I’ve kept because I loved the fabrics. I once told a group of quilters that I had picked fabrics for a quilt to go with the colors in my living room and they told me I was crazy, quilts don’t have to match anything as long as you like them. So, maybe in my heart I’m an A after all! I just need a little Zen Chic to help me along! I usually have a theme in mind before I buy fabric. Many of my quilts are given to family members so the theme may be favorite colors, activities, foods etc. Then I search for one or two themed prints and add coordiating fabrics. If I get too many theme fabric then the quilt will be reversible with different themes on each side. I’m an A when gifting – I really try to zoom in on the recipient’s tastes and needs. I’m a B when I’m experimenting with new techniques or color combinations that I’m unsure of. I’m a C the other 99.9% of the time. I am a B and am intrigued with the Zen approach. It would be lovely if I win as I love the fabric. I will consider buying the book. I love all sorts of colors and styles, so my answer would be b). I enjoy the process, but sometimes I end up with a quilt that doesn’t seem to fit anywhere. I am a B type person. I usually select a pattern & fabric that I love and can’t wait to get started working on it. The blue bundle of fabrics are beautiful. These fabrics and your book would be perfect to make a one of a kind treasure. Thanks for this awesome giveaway. I like to be inspired by books. There is always room for another quilt. The Zen quilts look like something my daughter would love. The fabric is beautiful. I usually know where a project will go or its purpose before I start. I think I am a "b". I usually see a pattern that I want to try and work from there. Luckily, the colors I am attracted to in quilting are also the colors I use in decorating my house (we had a red kitchen & family room for awhile — I loved it!). I sometimes feel like my house is a bit of an Easter egg with all the color — no white walls here. I’m a b/c. I just say my style is "eclectic". would love to be an "a", and I see where the book is essential. I like to get my fabric choices from something the person I’m giving it to loves, such as a single fabric, upholstery, picture, etc. The pixalated photo advice is a wonderful tool that I will incorporate into my fabric/quilt choices. Thanks for sharing your creative ideas with everyone. If it’s a quilt for us I’m generally an A. I use the wall color for inspiration, and add some of my accent colors. If it’s a neutral color room, that or a similar shade is my background for the quilt. Then anything goes. Thank you for chance to win this bundle. I’m an A as I like to pick fav colours for the recipient. That’s why I like to work with precuts – can usually find a line that reflects the recipient better than randomly pulling from my stash that is more of my personal style. I am only just finishing my third quilt and so far they have all been made with a specific destination in mind. I see something that inspires me and I look through my fabric to see what I have to make the quilt. I’m so inspired by her process and her tips….looks like a marvelous book! I’m an a/b/c. Sometimes a quilt is carefully thought out for a specific space or person. Sometimes I’m captivated by a piece of fabric or a new pattern that I just have to try. And sometimes I just quilt to be quilting so I do have a cupboard of quilts, many of which will be given away. Most of the quilts I make are for gifts. My home is a combination of southwest and northwest so I made a log cabin quilt with fabrics with wild animals, fish, canoes, cabins and forest which fits in perfectly. So, I am a zen planner when it comes to my home. The books looks really interesting and I love the fabrics! Probably fit into the B category. I’m just getting into quilting. I love to buy material but never seem to have the right colors when I decide on a project. I’m pretty much a and b. A lot of quilts I make end up being for other people so I’m always trying to match either their decor or their personality. But it doesn’t always work that way. I’ve been quilting for years 30 odd. But lately I’m trying to take more classes so try and get me out of some of my blocks (mind blocks that is). I am more of a "B" and "C" type. I see new ideas and projects that I want to do. then I’ll take a class and have a quilt that maybe without a home. If I like a pattern I use it. A most of my projects are smaller and I choose fabrics that work in the intended space to make them. None of your answers quite fit me. While I buy fabric and kits I love, I usually have a person or event picked out for the project! I only have a couple of finished quilts at home not being used. I’m a mixture of B and C! I have way too many quilts in the closet. I need some Zen love so I can make better use of my fabric. Thanks for the generous giveaway! I’m between A and B. I usually have an idea of where the quilt will go or to whom I am giving it. Occasionally though, I make a quilt because I like the fabric or the pattern. Then it goes into my "give-away" pile for later. I guess I am more of an A type quilter. I haven’t seen this book but most of my projects match the colors in my home. I’m not going to hide a quilt away just because it doesn’t match, I’ll just use it on the bed. Thanks for the chance to win this awesome giveaway! I start quilts without worrying about where they will go. Since I have neutral walls and neutral furniture, my quilts tend to fit in just fine. None of the above. I always make quilts in colors that I love together and enjoy using them anyways. The only exception is when I make quilts for other people. The book does sound interesting though and I love blue fabric. Thanks. None of the above – but then again my decor is not "decor", it is pretty much anything goes. This is a good idea though -especially when making quilts for others. I could fit into any of the categories! I have a closetful of quilts in my home that don’t really have a permanent home in my home. I tend to rotate them though, so at time they have homes! And the crazy part is, I continue to make more quilts!! B for me. I love the anticipation of the " next" one based on colour and design. i make a quilt for someone based on their interests or hobbies – for example chicago black hawks quilt was red, white and black with feathers fabric. For my home i choose colours that match my decor – cream;light green; and pink. I’m a (b). Thanks for the tips in Zen Chic Inspired! When I start a new quilt I usually decide on a general concept, block, or sketch. Then look through fat quarters and stash for colors and values to decide how many colors and values in each color I will need. I hang my quilts on walls or stack them open on spare bed and still small ones hang on quilt hanger, table toppers and runners hang in spare room closet for those are mostly season pieces. But no matter the colors used I show them all or give them away. and then find the perfect pattern. When it comes to quilt making, I just jump right in. Sometimes a pattern will inspire me or it might be a new line of fabric. The Zen Chic sounds like an interesting approach for sure! I fall between b and c.
I begin a new project by first deciding to whom I will gift it to! From there, it’s choosing colors, prints, etc that I either know that person really likes and/or ones which remind me of what makes them unique & special to me! My friends are rebuilding their home after bushfires destroyed the original house. They are using a gorgeous blue colour palette and a quilt in your blue bundle of Moda would be the perfect gift to celebrate their new beginnings. Definitely b). I make quilts because I like the pattern/fabric then I have no idea what to do with them. I usually end up giving them away. Neither a, b, or c, but d. I find materials that speak to me, and then pick what I will make with them. It helps that our home is rather eclectic! I am mostly a B quilter. I pick fabrics I fall in love with and make quilts. I then let my children and grandchildren pick one of the quilts they love. If I am making a quilt for a certain room then I am an A quilter. Though sometimes I feel like I miss the mark a bit. This book would be an awesome reference for that. does not matter to me if it "goes" with my room or not! I often make quilts just because I love making them and/or because I love the fabrics. Sometimes they match things, sometimes not, but I’m okay with that. If I am making a quilt as a gift (like a baby quilt or a quilt for a wedding gift) I try to use colors and styles the recipient will like. A gift registry can be a great source of ideas. I have been a big fan of Zen Chic fabrics and Zen Chic style for a long while! I am B, but would prefer a more zen approach. I buy a fabric I love and want to make something. Result – lots of lovely fabrics that I haven’t used! I don’t mind if the colours don’t suit – it’s the creating that I like. I guess b is the closest answer, but I’m lucky to be able to hang them in my studio if they don’t work so well in the house. A little a, b, and c! I’ve been trying to bring brighter colors into my house. And I know before I start they won’t fit with my traditional decorating! I make quilts just because I like to make them! I am sure anything that does not work with my home will find another place to live at some point! My quilts start with a purpose–to fit a space or a friend’s, to work a pattern I’ve fallen in love with, to express a whimsey I have. I make quilts because I like them OR I make quilts for family using the pattern and colors they specify. I would love to have the book and fabric to help me in my choices. Hardly ever think about making a quilt to match my house…….. But, Always make one to match my mood or color way…………..
Then when finished decide whether it will be mine for use……. Go to a loved one today, or lay in waiting in the closet……..
I’m glad I have many places and folks to use my quilts because.. I have piles, shelves, and boxes of quilt fabric in waiting…..
c) I have a closetful of quilts that don’t have a home in my home! But mainly because they aren’t quilted yet! I’m drawn to color and/or a fabric line, usually the same colors I have in my home. I go out on a limb color-wise for my grandchildren’s quilts! I’m somewhere between b) and c). I make whatever catches my eye and then figure out a place for it. I am a little of A and B. Sometimes I am specifically looking for fabrics that match a room in my house. However, sometimes when I am at a fabric store there are fabrics that just catch my eye and I cannot live without. Some projects I make are perfect gifts for others. I choose patterns & fabrics I like. My rooms are not "matched" so it really doesn’t matter. A lot of my quilts are for gifts or charity. I don’t end up with a closet full of unused quilts. I typically start a quilt by finding a pattern I love. Than, I go first to my stash and find what I have and if I have to find other fabrics to go with what I have…..hurray!!! I love, love, love fabric. I usually have a purpose for the quilts that I make. I’d vote more for A. The book and blogpost have definitely given me some food for thought! None of the above! I’ve just started quilting. . . I choose projects based on liking the project (especially the colors) itself, not whether it fits in with the area in which it will be used. I guess that makes me a B quilter. A. I make a quilt for a certain space. although i have been known to make a quilt for one space & end up putting it somewhere else! C. I have inherited several quilts which I just store. It would be nice to use some of them. I also have some quilts that I have loved … to death; they are falling apart in some areas. I would like to know what I could do with them, too. My quilts were always the same colours and tones. I’ve tried going outside because I fell in love with someone’s design but when I finish I don’t like it. When I go back to my colours I feel warm and they work in all my rooms. I take the ones that don’t work and fold place in between others on display and then they don’t stand out. I’m always looking for quilt inspiration, whether it is in the space the quilt will live or it’s simply an idea I’d like to play with. Sometimes ideas come from fun books like Zen Chic . . . while others are inspired by a grouping of colors like those in this collection. C I have given away most of the quilts I have made. I have only a few that I have kept. I start my quilts by thinking of the person to whom it is going to. Pattern, style, colour are dependent on the person. My quilts generally have a person or a spot in mind when I start. Often I make a quilt because I want to MAKE it, not because I want to HAVE it. So I get the joy of creating, then find someone else who might like it. But the cat likes everything I make anyway. b) and I don’t have any guilt about them, I had fun making them. I usually pick fabrics that will blend with the room where it will be used…it takes too long and costs too much to make q quilt that will be stuck in a closet! How do I typically start a new quilt project? I usually have a plan for the quilt and try to fit it to the personality and likes of that person. So I guess I would be an "A"
I am part a and part of b. Today the fabric is so beautiful but usually I think about where the quilt will be displayed. I am trying to become more of an A as other than holiday quilts, i dont have decor quilts like I wish i did. The decor quilts I have started or that are waiting to be started always take a back seat to other projects. Time to change that! This book looks great! Actually given my love for fabrics I think I am part A, B and C! I don’t know where a quilt is going to end up when I start it. It really doesn’t matter as choosing the fabric and making it is the best part. Sometimes they end up piled waiting to be layered on a bed or given to someone that needs a symbol of love and home. I am the most like a). I like to gather information about the person who is receiving the quilt more than information on the surroundings. I think I’m more an A as I usually have an idea, from the colors, where I’ll be using my quilt. I think I’m (B). I’m like Brigitte’s sister (& probably countless other quilters) – in that we fall in love with fabrics and want to make something beautiful with them, never giving much thought to whether they will fit in with our decor. Truth be told, my home decor could do with some polishing. Maybe creating nice, coordinated accents would do the trick. I think this book is a great concept, and will make many of us re-think how we approach things. I love the Zen Chic look and need to think more about where the quilt will live. I fall mostly in the B quilter category. I fall in love with a quilt and just have to get the kit or fabrics to make the quilt. I do intend to sell some of my quilts, so it may be okay to do some of that. However, I really would like to make the perfect quilt for the perfect space. I think this book will help me do that. Thanks! I start a quilt that inspires me. My quilts rarely finish with the same thought that I started with. Sometimes fabric inspires me, sometimes the pattern, sometimes both. I am usually inspird from a fabric, a picture or a group of colors. I love the idea of picking a place in my home for the quilt and going from there to find color, texture and inspiration! This book is beautiful and such inspiration to see! I can’t wait to start this quilt project. I don’t think that I have any quilt that fits well in my house. I think I really need to read the whole book. I have to admit that I am a combination of b and c. I need this book! I want to be an a!!!!! Think I’m a B — if I like the pattern I’ll make it and give it away if it just doesn’t work in my home. b: I am usually inspired by a pattern and the need to make it. It doesn’t matter to me if it matches or has a home. I would say answer b. I make quilts because I like a pattern or the fabric. I do not always plan ahead. I usually do not, as a matter of fact. I do not think I have ever had a quilt turn out just like I had envisioned it, but it usually is even better! b. II make quilts if I like the pattern and fabric, even if it doesn’t match my house. My answer would be (b). I mostly make things to give away, sometimes from fabric that is given to me. But when I see a pattern that I love for myself, I make sure to use colors that I love, or that match my home. Sometimes they don’t match very well, or the project doesn’t turn out as nicely as I had hoped, so I give them away too! Sadly, I am a typical "B" personality. I am trying to be like my quilt friends and give them away to someone special. It is taking me some time to say goodbye to my quilts. I love them all but love the feeling you get when you gift them to someone. It’s a process!!!! I’m getting better!!!! B. Some quilts are in a perfect place, some are still waiting to find their spot. I like a variety of colors and designs. I have always found a room to house my quilts. 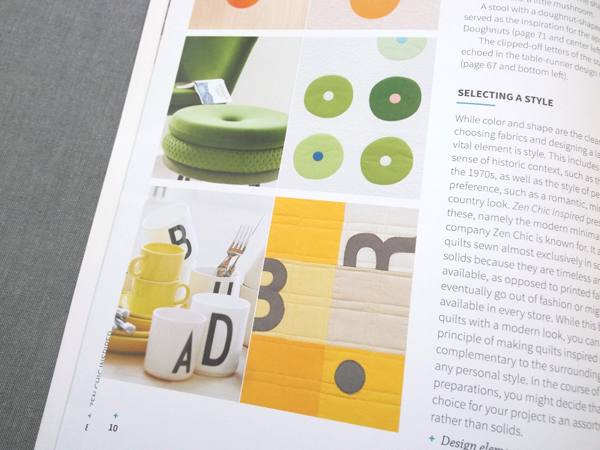 I like the idea of the Zen Chic book–to pick my colors for my quilt to match the room decor. (C) Sadly, I have many closets full of quilts that don’t really fit in anywhere in my house! I love bright colors but have a very subdued/neutral style in my house. I need this book to harness my quilt-style with my lifestyle!! I make quilts because I love the pattern and the fabrics. I usually can find someone who would love to have it. I’m very in tune. I know exactly where my quilts home is going to be. Thanks for a chance for this beautiful bundle. I just make a quilt because I like it…I don’t worry if it "fits" or not!!! I have many quilts that just sit around until someone says they need one or I just want to gift them away. Interesting perspective. I’d love to read more. I usually buy fabric that I like/love and more often than not it does not really fit into my house/surroundings. B and C I love making quilts and do not always know where they will go. Sew I do have a stack of quilts. Maybe I should try to find my Zen too and the quilts will find homes some here and some away. My house is a jumble of styles and so are my quilts. Hmmm. Maybe I need to read this book. Most times I have an idea as to where the quilt will go but by the time it is finished it will have moved several times. I believe I actually spend more time planning than sewing: whenever I make a quilt, I like to include design elements and techniques which are new to me, so I do a lot of researching; and if the quilt is for my own home, I make a point of having a decorating scheme in my mind: I look at a lot of photos of rooms that please me and where I can see myself living; I pin those photos and compare them until I am sure about the kind of "feel" I wish the room to have; then I carefully plan a quilt design that will help me attain that "feel". However, sometimes I do make quilts on a whim without caring whether they will complement my decorating scheme; mostly they are scrap quilts I make for the sheer fun of it! These quilts go to a basket in a corner and live there ready to be grabbed by anyone on a chilly movie evening. Those are the ones that really get dirty and fearlessly visit the washing machine often; they are made to become old, and the older they get the more we love them! I have only made a few, and with one exception, they were gifts, so "D" – none of the above (the one I kept is hanging on a wall). I think "b" is closer but all my quilts are either used in my home or given away. A! Thank you for asking. a) I’m in tune with Zen Chic Inspired—before I begin a project, I like to gather inspiration from the space I want a quilt to live in, but I don’t mind introducing another, maybe contrasting color to shake things up a bit. Beautiful fabric up for grabs here! I hope it comes my way! I am for the most part a B quilter! I make quilts that fall into the a,b,and c categories. I guess I’m a "B"
B definitely B sometimes I can be Inspired by a space and the quilt is on display but of course there are several more in the closet. C) I so enjoy the process and especially love experimenting with design and colors. a, I try to consider the place where my quilt is going so it will fit the color scheme and style. Since I have been quilting, zen chic has been my favorite fabric to work with. I would have to say that I try to lean more towards A, but also acknowledge that B plays a role in the final product more times than I probably admit to myself. Ideally, for me, it would be good to only start a new project for someone when I feel that I have a good idea of what they want/need, especially in regard to colors used. B. Just started quilting. But as any thing else always put things to use. I would like to plan before jumping into a project. Sometimes just have to try something new. Would like the book for help,also my favorite color is blue. I am guilty of falling for a fabric or two, purchasing 1 or 2 yards, and adding it to my closet shelves of fabric without a design in mind. I make quilts for children, and would like to be more intentional in fabric choices. I’m a combination of a and b.
I am guilty of buying fabric I fall for, without a plan in mind. I make quilts for children and want to be more intentional in my fabric choices. I’m mostly an (a), although I do admit to sometimes just sewing for the sake of sewing quarter in seams and then giving the quilt away. It is fun to contemplate place and person when choosing what quilt to make. I make a quilt because I like the pattern or have someone to give it to. I guess B would be closest, but I really just make quilts because I like them and not even think about where it’s going to go. I am a B quilter. I would love to fit in the A category someday. Love the fabrics and the book! B. I make quilts I like and use them even if they don’t always fit in. I give a lot of my quilts away by letting people pick which one they want. My answer would be half As and half Bs. Sometimes I make a quilt because I like / want to try the pattern and will swap the fabrics to suit my home or the person I’m making it for. Sometimes I choose the fabric for a person and then find a pattern to fit the fabric. I love the tones in your giveaway pack. A quilt in those fabrics would make a lovely item to fit into my bedroom. None of the above really fit for me, but since most of the quilts I make are for donation, it really doesn’t matter. I can make whatever I like, and if it doesn’t fit in, it really doesn’t matter, because someone else will love it. Thanks for the opportunity to win. I haven’t finished a quilt yet, but I do choose crochet projects based on interest in pattern and yarn, rather than whether it specifically goes with other clothing I have. I think I’d fit in the "B" category. My quilts aren’t decorative accessories. I fall in love with the fabrics first, then the design so no, I don’t plan ahead. I need Zen! I get inspired by the fabric and then match it to a project. Most of my quilts are UFOs not completed or ready to be used in a home. I’m working to change that. C. I have lots of finished quilts and tops with no homes. B. I quilt patterns I like and them find a space for them. Wait a minute, quilts are supposed to match something? Most of my quilts are made for charity, the local shelter or infant care home. Sometimes my husband HAS to keep a quilt I make. Those are in the family room all the time. I guess I just don’t fit any, a, b, or c. I always have a place for my quilts, I give them away! What better reason to buy more fabric? I am a basic b person. Sometimes I finish a quilt before knowing where it is going to go and it ends up sitting in a glass encased quilt cabinet until I find someone who I know will give it a good home. I give almost all of my quilts away. Quilting is my hobby and I love the feeling I get when I see the eyes of the people I have given my quilts to. It brings great joy to me personally. Definitely B for me. But instead of stashing these finished projects, I would think of friends and family members who may be more than happy to receive the quilts I made. I am inspired by a fabric I love, or an idea for a technique I want to try. I keep my walls, floors, and big pieces of furniture fairly neutral so I can change the look with quilts and other accents. I start my projects with a smile and excitement! I may not know who I am making the quilt for, but it won’t be tucked away! I love seeing my quilts!! Definitely a combo between A and B. I have a closet full of material, but all my made quilts have been given away to those I love. Someday, my finished projects will be greater than my UFOs. I’m a little of each of the examples. I do like to have a project with a purpose, but I’m just happy to be quilting. Because I’m still very much learning, I usually choose first & see where it goes later. So I guess my answer is "b"? I have been sewing & quilting for less than a year now, so a lot of my projects are just trying to see what works & what I like once it’s worked up. Most of the quilts that don’t fit in my home get donated to a charity, that makes me happy, I get the joy of creating a quilt and someone else gets to enjoy it. I ‘m guilty of getting the fabrics I fall in love with…and for the last two years the fabrics are blue! This collection is to die for!!! The blues go in my bedroom and sewing space! I am new to quilting, so I don’t really know which answer to choose. I love what I read in the article and learned some good tips! Yep I’m a B… Our home is a Rustic Contemporary Western style and hubby made a deal with me when we built our home around my longarm.. He said if I got the biggest room in the house for my QUILTCAVE then it ALL had to stay in my QUILTCAVE and not scattered about the house. So most all my quilts are hanging or showcased in my QUILTCAVE..I’m ok with that..but we do have a quilt or two folded up in a display cabinet and one on our bed under a comforter! I’m AB, somewhere in between. Ideas flow in my head, but my hands go a different direction sometimes, favored by colors and sizes in my stash. C – Closet full! I make a quilt because I like the pattern/fabric/technique – eventually they always find a home. Great idea, and so glad to see it in a book. It depends on why I’m making a quilt or project. If it’s for me, I choose fabrics that coordinate with where it’s going. For friends, the same thing. Other times, the fabric dictates the project and the colors, and those are sometimes donated or sold. Since I like a variety of colors, the quilts I make easily find a compatible home, but I would love to read the ‘Zen’ book. It looks like it would help in planning a better color fit with quilts. Thanks for offering the book & fabrics! If I fall back n love with a quilt pattern I really don’t care if it fits in my home. The joy is in the making. I start a quilt because I like the pattern and fabrics I’ve chosen. It may go in a room or not, but it is a work of art that can be used by me anywhere in my home. I’m really curious about the Zen approach though–definitely a new approach I want to explore. I pick fabric I like. Get a pattern I like. While working of it I feel, where it will "live" after finishing. This is the way how it works best. Thanks for this giveaway and your "work for us". I make quilts that I love the patterns or colors- so some are put on display and others are in my closet. This book Zen Chic would be a good reference for making quilts to enhance the decor in my home. I am a B quilter. Oh, I’m all over the place. I guess B is mostly me – I don’t make quilts that match a space, but I don’t hide them in the closet. We use ’em!! I love this idea, however. I find as I age, I crave more unity and calm in my space. Thanks for the chance to think about this. I fit in between, A few years ago I was given a 5`sq collection, I didn`t like the fabric line but saw a pattern I like for 5`pieces and now the quilt hangs on a railing above the split level entrance to my new home, It doesn`t matter if it fits as the space is not `decorated` (PS. I have also placed pins I earned as a Girl Guide Leader on it, a 2-in 1 decoration). Now I buy fabric to fit the new rooms I have to decorate. B fits me best, I think. I make quilts because I have to, and then I think of what to do with them. I guess I would have to say "b) Sometimes I finish a project before I know where I’m going to use it." Although I tend to display the finished quilt even if it doesn’t match. I usually choose my fabric because I like it, not because it would look good in one room or another. I have a closetful of quilts that don’t have a home in my home! If I am making a quilt for someone, I usually know them well enough to choose fabrics that fit their décor; or I ask them to go through my stash and find colors & patterns that speak to them. From there, I use my own interpretation to make something they will love. If I am making something for myself, I may find a fabric I "can’t live out" and ignore décor thoughts. However, I usually think about placement before purchasing new fabric. I’m closest to a (C); I make items that I have no use for (how many quilts does an elderly couple need? ), so they go to charity. I enjoy the process, but not necessarily the end product. I guess I don’t worry about my quilts fitting into my decor. I pick the fabrics according to what I like and the pattern ! I can use some help from Zen Chic inspired, i belong in the b-category. I start with a colour and look for matching colours or i find a pattern that i like and start from there, so far. I once choose a kit with pattern and fabric for our livingroom years ago, but it lost the appeal. So not so lucky in this matter. I like Brigittes new approach and love to win her book and the great fabric. Thank you for this opportunity! Hi there, I am more of a B person. I make things because I love the fabric and then it doesn’t fit. So I have a tub of finished quilts that aren’t displayed as well as a tub of just quilt tops that haven’t been quilted yet that just don’t go with me or my home. In fact just yestiI took about 8 quilt tops in to work and offered them up to my cowory(who I have taught to quilt). They all picked the ones they loved and went home happy. Me, trying to learn not to make something just because. None of the above. Most of my quilts are given as gifts. I am still pondering what I want to make for myself. I’m a B, too. I start with fabrics that inspire me and find a place for a quilt in my home (or not) after I make it. I would like to try a different process. Thank you for the insight to start with the space the quilt will live in before you plan a quilt. A lot of my quilts go as gifts. I do usually start with a style of fabric. Now I can give it a more unified look. I frequently make quilts because I love the fabrics/colors, but don’t have any specific plans for where they will get used. Usually in the A category, but once in a while, in the B.
Blues are my favorite colors! Love the modernism in the quilts. I agree with LoAnn, I make a quilt because I really like it and want to make it. I use it where ever I want, even if it doesn’t necessarily "match". a). I consider the environment in which the quilt will live when it is finished. I consider color and style as well as the personality of the recipient. I’m an A I have to know where it is going before I start. oh, C for sure! I make ’em and I either give them away or stick them in a closet! But I also make seasonal quilts that I display at the right time of year, regardless of whether they match my decor. I’m a c. I have all sorts of quilts that don’t fit. Who am I kidding, a handmade quilt goes anywhere. I’m definitely a case B. I love brightly colored fabrics, but I have a very neutral living space, so they don’t really match my living space. The quilts end up in my closet until it’s cold enough to have an excuse to get them out. Also, I have another question if someone sees this? How do you match a baby quilt to someone’s nursery without giving away what they are getting? I usually decide on a pattern I really like or fabric line I truly like and go from there. I WILL find a place to put it. B-I usually find amazing fabrics to fall in love with and then look for a pattern to use. The Zen Chic line is my favorite -discovered it while visiting my daughter in California. It sparked an ongoing interest in modern quilts. Now back in Pennsylvania it’s exciting to come across more: "Modern Background" and "Flow" are favorites! As a fairly new quilter I have mostly been inspired by particular fabrics or quilt patterns, but I love the concept of drawing inspiration for a quilt from the room where it will live. I can’t wait to explore this idea and turn it into quilt inspiration! A: I like to choose patterns and colors for the person and where it will be used. I try to make something that will fit the personality of the person I am making it for. I guess I should try to match their décor! b)… I’ve been known to fall in love with a quilt or quilts on instagram, create something similar and then have no where to display said quilt. 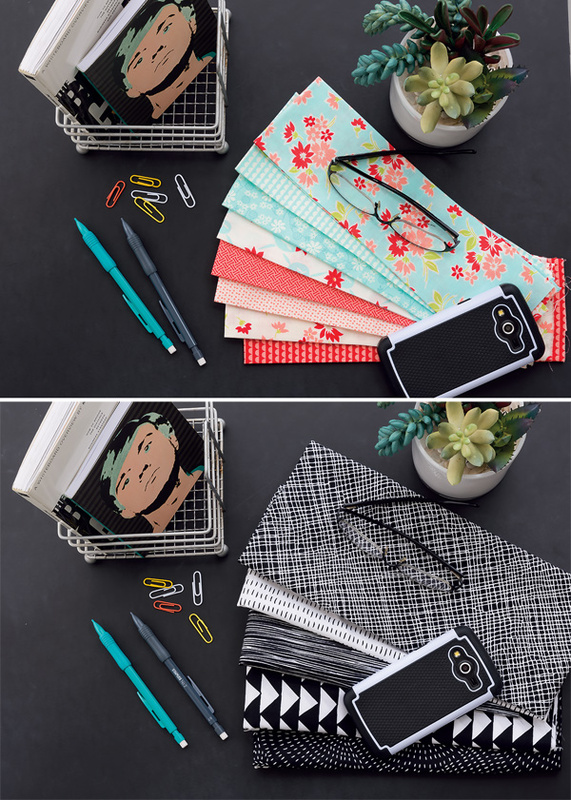 I would love Zen Chic’s book and the fabric bundle! Thanks for the giveaway!!! I am very versatile; so mostly (b)…loving all quilts. Love trying new techniques to make the quilts come alive. Having a quilt ladder to display some of my quilts is a work of art in itself. Love looking at all of the different styles, colors, etc. If I am making a quilt for someone, I try to make it neutral; so that it will fit in their home. I’m fairly new to quilting so I do both A and B. Most of the quilts I have made so far have been gifted to family, but I have a couple at home that I have made and specifically chose colors that went with the room. Doing a block of the month now and it will be gifted, and another that will be for us in our new travel trailer. I admit I make quilts that I love but don’t really fit in with my house decor. So, they get stashed or stored out of sight. Unfortunately d) none of the above. I have not made a quilt for myself or my home. I make prayer quilts for others and I’ve made one for my Great niece. Maybe I’m a "b"–I just pick out fabric that I like. I like to make quilts with a special person/place in mind. But sometimes I just sew and see what happens. Somewhere there is always a person who will enjoy a quilt, even if not my style. definitely b/ I make quilts because I like the design and/or fabric; then decide where they will go. Definately B, but inspirations from books and blogs like Zen Chic are helping me to spread my wings and break my traditional ways! I. Fact, I just bought my first kaffe bundle! Squeeee! Reminds me of that old Dr. sues line, "Oh the places you will go!" I’m ready! I have one of my quilts on each bed in the house and one or two more … the rest are made and go to many homes… but each seems to be loved where it is at… so I guess I am more of a (B)… and as long as they are loved life is good. I am a beginning quilter in a new house so have been carefully thinking about location before I choose fabrics. However, I have a bit of a stash that doesn’t match my décor. But that won’t stop me from stitching through my stash. I am an A. I like to have a certain person, place along with pattern and colors for the quilts I make. I love your write up! I love your examples as well! what a great giveaway!! Mostly B, I suppose, but I’m not averse to using any quilt anywhere. My quilts are generally more coordinated than the rest of my decor! I am usually inspired by a fabric or by a great pattern….not always with s recipient in mind!! Sometimes it evolves to to speak to me that it "fits" someone special. I have to admit that sometimes I finish a project before I know where it’s going to be used, and it gets stashed away somewhere. I’m trying to do better, but it’s so tempting when you see something you love and want to make it! Thanks for the chance to win the fabric and book! Most often it is the fabric or pattern that inspire me, although recently I find myself looking more towards the end of where it is going because there is just not enough time to do everything. I want to put my energy into what will be seen and enjoyed more. I have been admiring Brigitte and her Zen Chic fabrics and patterns for several years. Lovely and inspirational. I haven’t made that many quilts yet and have given away the ones I have finished. I usually don’t think ahead where I am going to use a quilt. If I had to pick where I would fall it would probably be in the b category. I’m a B. I make quilts that inspire me and most of the time they fit in my house or I can make them fit. I would say none of the above because I just make them because I like to whether I have a place for the quilt or not. I would love this book and the blue fabric! I fall in love with the fabric and then decide what it is going to become and where it will be used. I am going to go with B. Thank you for another fantastic giveaway! My quilts don’t always fit my decorating, but I have some plain hallways or neutral rooms that I can put almost any quilt with. Since I like to rotate my wall hangings so I can see them all, it’s a good thing! I’m an a & b. I only have a few quilts but I have given away over 70 quilts to friends & family. The quilts that I give are made with the person or couple in mind-favorite colors, hobbies, sports etc. Thanks for the giveaway maybe I can gain some zen. I don’t quite fit in any of the three categories. Sometimes I have a space already in mind for a quilted piece. Sometimes I have the quilt idea that will need to find its space. In any case, if it’s quilted, it’s all good. The majority of the time I am an "a" since I like things to coordinate. But sometimes I fall in love with a fabric or kit and those become gifts or the odd duck in my home. I give most of my quilts away, so I do not have a stash, but it would be fun to make something suitable for my home. I’m an a. I usually have a place or person in mind when I start a quilt. I’d love to win the book and learn to match my décor and quilting efforts. I have to say I’m a B with a little touch of C. However, quilts are unique in that they can fit in with many different decorating themes. I enjoy scrappy quilts as well as those with a more dedicated color palette. But with the quilting ladder (that my husband is planning to make for me) and open shelves the combination of different quilts stacked or hung together can add a warmth to almost any room. I have made many quilts over the years and given away more to family, friends and charitable organizations than I have kept for our home. Brigitte’s new book sounds very interesting and I love her new fabric line. I’d have to say "b". Sometimes I fall in love with a fabric collection, or a pattern, and go headlong into the project. I’m not good at thinking things through sometimes. Would love to win this fabric packet and the book! I have made quilts for family, but still have not finished on for myself. I just can’t seem to find the perfect color or design. I think I need some zen. I’m just getting started with my quilting, but I can already honestly say that I’m not likely to ever be someone that makes something for a space just the person or so that a space has a quilt. Color as far as fashion goes has never been nor will it ever be my thing. I just like to make things. I see a pattern or fabric that I like and go from there. Doesn’t matter if it doesn’t "fit" in my home – it’s the process that I enjoy. Having said that, I like the Zen Chic approach to choosing colours, especially when making quilts for other people. They can send me a photo and I could go from there. Great idea! I am an A. All of my quilts have a place in my home. Thanks! Usually I am inspired by the room and choose fabrics that will bring the design together. However, there are times, when a fabric collection or even a particular quilt pattern, just really speaks to me and I want to make a quilt using those fabrics or that pattern. When that happens, I either find a place to use the quilt or give the quilt away to a friend or family member. After all, the joy is in the process of creating! I make what I want to make and if it doesn’t go anywhere in my home – I gift them to friends and family! There is no better fun than giving a quilt to someone. I make quilts for gifts as my home has a quilt on each bed. I make quilts with patterns and fabrics I like , then they are gifted. I’d say b fits me best. I simply make something I like regardless of fitting into a space. I probably should do more planning. Thanks for providing some insight as to why my quilts get put in the closet or under the bedspread! All the quilts that I have made so far have been gifts. For the baby gifts I have sometimes asked the colors of the baby’s room. The twin sized quilts have been for grandchildren, and sometimes their mother picked out the fabrics. Other times I chose fabrics based on their interests. I made t-shirt quilts for the two oldest granddaughters. For one I simply took her to the store and let her pick out the fabrics. Her sister’s t-shirts all had to do with music, so I picked up fabrics with music themes when we were passing through Paduka one time. I have 3 more gifts to make and then I can make some quilts for us. I like the idea of picking out fabrics based on the colors of the room where the quilt will be used. I am between A and B – and I really could use the blue fabric bundle for my new home – because my color palette is beachy blues and white and this would be perfect! Have a wonderful day! Definitely in tune. I know what room or place I want my quilt to go and that’s how I select my fabrics. I have to have an idea of what color scheme I am looking for before I head over to my local fabric store. Thanks for the giveaway. What refreshing fabrics and colors! D. None of the above. Quilts fit in anywhere in my home! I am a C. But would like to change that. I tend to make quilts that interest me, either by design or by technique. I also like kits that catch my eye. I tend to have an eclectic house where things I like seem to fit in, or I give them away to someone I think would enjoy them. I just enjoy quilting and designing. There are always those who need a warm quilt, so nothing is lost. As a long time quilter I probably would fit all categories a bit – hate red but have Christmas quilts, love color but feel some are garish in my home but most I make are in my favorite 3-4 colors which I decorate in . I love the fabrics in this giveaway. I make quilts that I like and fall in love with the fabric. My house is eclectic, so anything goes. I love these quilt designs and fabric and would love to learn more about this process! I’m an A AND B.
I usually have a "destination" in mind for the quilts I make, so I’m confident they will have a home when they’re done. So, I guess I fall into the first category! B – sometimes I fall in love with a fabric line, create a quilt then discover it doesn’t quite fit with my interiors. If the quilting project is a gift for someone, then I definitely consider their color scheme. I tend to quilt for myself with fabrics that catch my eye which doesn’t always translate into a place for them in my home. I am definitely a b) and c). In fact, I just finished a cute table topper that will not fit anywhere in my home (and probably no one else’s either). I love the aqua and orange combination and I chose my fabrics around a piece of fabric that "jumped out at me" at a recent quilt show. HW, none of it works for me which is why I only made four blocks and it became a topper instead of a quilt. Would love to win a bundle of coordinating fabrics. Thanks for the opportunity. Working on my first quilt, so we will see how my skills develop. I have a new sewing room I am enjoying for this new adventure. Blue is my favorite color! I guess I’m the oddball, because I change quilts and table runners to change the decor and colors in my house rather than the other way around. My decor is pretty neutral, so it works. I love some of the color tips in this book though, and the blue fabrics are wonderful! B for about 50% of my makes. I have made a couple of quilts that had no purpose or future home, just trying out a technique. Most of my quilts though are made with someone in mind and I try to match their personality. Might not go with decor but they have always been loved. I think I’m mostly a B with a little A thrown in. I really like the ideas contained in this book and the gorgeous fabric too! I start with a color that catches my eye and go to the stash to see what matches. All to often I start and put it to the side something else catches my eye and interest. I make quilts to use so durable and block looking is my style, I love to look at them displayed but feel that much work should also be enjoyed and snuggled in! I usually make a quilt because I like the pattern and colours so I have some that don’t fit the decor. But a lot of them do by accident. I love the blues and they will fit. I choose projects by personal appeal and fabrics by color! So I have a huge fabric stash with no projects in mind. Definitely a "c". I’m new to quilting and have only really done one project but based on that I would have to guess that I will fall into category B.
I’m still too new at quilting to have a backlog in my closet – I gravitate towards colors and patterns that make me happy, and don’t worry about whether it matches the rest of my house or not! 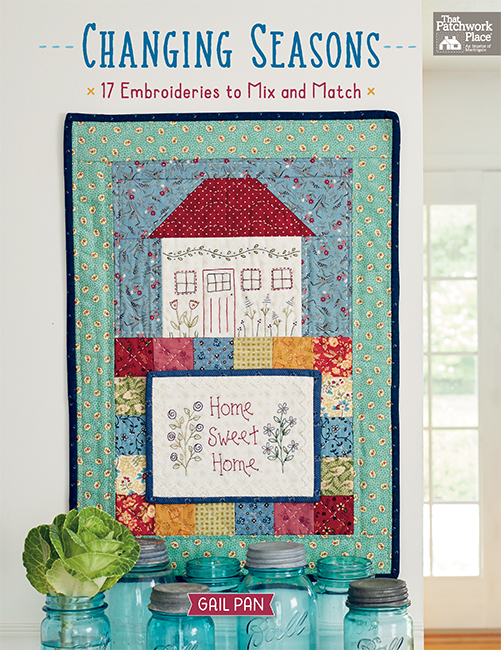 We are near to becoming empty nesters, and I would love to use the ideas in this book to make nice quilts for myself and my soon-to-be-clean-all-the-time home! I usually just start a quilt because I like the colors–don’t always think about where it is going to be! I guess my answer would be C. I have lots of quilts that are piled away as they do not have a home in my home. B fits the best for me. Seem to end up with a few that just do not seem to have a home. I am primarily (b) but am still a new quilter so don’t have too many finished projects under my belt yet. I’m definitely a "b", what a fantastic book! B would be my answer in the past (my pile of quilts testifies to that) .. however my last 2 small projects were planned for a specific room. The book would be a great incentive to continue this path. For me it’s B, I sometimes finish a quilt before I know where it will go in my home. But then I spend some time finding the perfect place for it or make a perfect place. If I really can’t find a place, I gift it to someone I know will have a spot for it. I see something that inspires me, a combination of colors, the shape of something. I think I am a B quilter. I make quilts that I love and then am disappointed they do not fit in my home decor! This book might cure me! Finding awesome fabrics inspire me, then I look for a pattern to use them in. Don’t believe a quilt’s colors has to dictate what room it goes in. Color is my thing! A. But only because I don’t have rules to a beautiful quilt!! I am closest to B – I see patterns I want to try, go thru my stash, make it, then decide where it is going or who gets it. I am definitely in the C category. But after making many, many quilts I agree with the suggestions in Brigitte’s book. It is high time I PLAN before making my next quilt…who is it for…where will it be used…if for myself, imagine that, follow the same scenario. I never thought of this before…just jumped in because I loved a pattern, or fabric bundle…now I will make time to think it through. Thanks Brigitte! Probably fall between a and b. Love Zen Chic. I am mostly a B and C. I do have some quilts that "go" with the rooms, but sometimes I build the rest of the room around the focal bed quilt. Sometimes it doesn’t quite turn out that way though, and into storage they go! c) would be my answer because I create my quilt to appeal to both the young and their moms. I joined this charity group at church that donates quilts to needy children; so all of my quilts are geared toward that charity. Thanks for sharing the beautiful Zen approach and thank you for the opportunity to win the beautiful book and fabrics! Most of the quilts I make aren’t for me, but I did make one to match the family room decor. My answer would be a) I’m in tune with Zen Chic Inspired—before I begin a project, I like to gather inspiration from the space I want a quilt to live in. Lovely Zen inspiration! I fall between a and b. Often I fall in love with a fabric and then stash it until a design hits me. I also will start a quilt with a season or holiday in mind and then switch the room up with a hint of that season through my quilt. Both a and b. Sometimes I make a quilt for a certain room to display and other times I make a quilt because I like the pattern. I am fairly new to the "Modern" quilt making. I find this book to be of great inspiration to me. Especially find the pixilation interesting. Would definitely give Zen quilting a try. The book would go well with my library. I think that I am a cross between A and B. Pretty much of a A, but I have my moments too. Those I give away to someone who loves it. I am definitely "B" but I usually have a friend or two who love anything I do, so I don’t have any extra quilts laying around. I’m somewhere between a and b. I’m a fairly new quilter so I’ve given away more quilts than I’ve kept. I am definitely a. I tend to plan it all out before I start so I know where it’s going & what colors I want to use init. I’m some of B;however, I don’t really mind so much if the colors and the room are not so coordinated. It’s soft, colorful and it’s a quilt. I have a home, not a magazine. B, I often want to use new fabrics and sometimes they just don’t fit in my house – give away time! None of the above. I’m all about scraps and intuition. I am somewhere between A and B. when making for a friend I try to match their room, but I do buy fabric just because!! Probably A if it’s going in a room in my home. However, I make many quilts for baby and as gifts that I have no idea how it will be used so I just make it any way. I have some quilts folded up because they don’t "go" anywhere, but I still love them. This tells me I need to add more color to my home to match the quilts! I would have to say I am a "c" person. I love making quilts and it is usually without a plan on how I am going to use it. thanks for the pretty giveaway. Mostly B. I finish quilts without knowing where they will be used. But they don’t get left in any closet. Nothing else in my house "fits", so in that regard the quilts "fit right in". Most of the projects I make are because I want to make them. They are either kept, given as gifts, or given to charity. I make the item then decide where it is going to go. Most of the projects I make are because I want to make them. I like the fabrics, the pattern, the idea. They are either kept, given as gifts, or given to charity. I make the item then decide where it is going to go. I am "A" I always think of the colors, but if I like the fabric I make the quilt I think will make it sing. I’m definitely a B, with slight A tendancies! I’m a little of all 3. Although I start out with a specific purpose, by the time I finish some of my quilts (I am better at starting them…) my house or my style has usually changed. But all of them are loved, even if they don’t reside in their originally planned spot. I’m all three! Sometimes I choose colours that compliment the space for the quilt, sometimes it’s stash-busting, with no colour scheme in mind. Whether they match or not the quilts get used! Well, I am a definite "C". Love to make scrappy quilts and to try new things, do the New Years Day Mystery quilts…. can not be Zen when doing that. C. I stay busy piecing fabrics I like, they usually don’t have a spot until someone wants them. I wish you had a choice D saying:L "Other" because that would be me. Haven’t heard about the book though it appears inspiring. I don’t stash my quilts away – I give them away. I love theme quilts made for someone specific. I look through books, pinterest, magazines, and such for quilts I love and then browse through a fabric store looking and "touching", of course, every fabric that calls me. I then fall in love and the rest is history. Put me in the "b" group. Making a quilt for a technique or fun pattern or family member is what I usually do. And then if nowhere in mind for it, our guild has many charity opportunities for its home. And I love the fabric color!!! I just like the quilt colors from how I feeling at the time. It doesn’t matter to me if it doesn’t fit the room. I rotate based on seasons. I would love to win this book, though. thank you. I usually didn’t worry about having quilts that do not match my house. Eventually, I find a home for them with a friend or a charity or move to a furnished house where they do work. But now because we have retired, I will be decorating our final home with our furniture and would like to make quilts that will give a unified appearance. So I am a quilter who has a lot of different quilts who would like to be able to make quilts that will fit our final home. I start projects when I find a pattern that I like then I buy the fabrics. Once in awhile I buy fabrics first with somewhat of an idea of how I want to sew them up. Thank you. I always want to make quilts as gifts but never knew what colors to use. Now I know where to start so my qift will have a home. 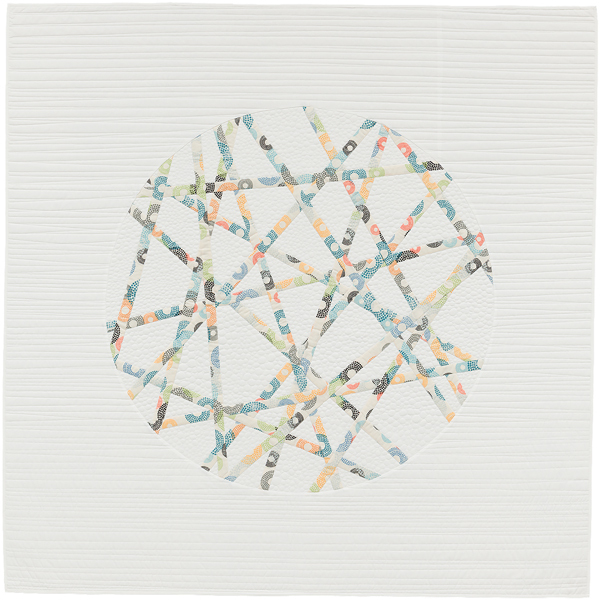 I am a D quilter–any finished quilt has a place in my home. I’m a mix of a and b. Some quilts are done for a specific place with the fabrics and design chosen to fit for a use and place. At other times I am guilty of the "falling in love" with a fabric and making something from it. However I am quite happy with this approach as I am relatively new to quilting and have plenty of friends and family who can be the recipients of quilty gifts as I improve my skills! I start with where it’s going: a new baby, holiday, wedding–or I just find a fabric that I cannot live without or a pattern that intrigues me. I’m between A and B. If the quilt doesn’t fit into a room enough for display, it will get used as a throw. A little of both "A" and "B". I usually make what I like with fabrics I like without concern of where it will fit in, if really don’t like it once complete then given away to my daughters (their taste is different than mine. I am a absolutly B. I need this book!!! Definitely C. I make a lot of samples for the LQS and some of the come home. I gift a lot to family, but there is still quite a stack. I’m between b and c! I love making quilts and don’t always have a plan for them. Plus, my house is just a mismatch of all things I love so sometimes it doesn’t matter. I’m a C. I just love making quilts of all colors and hopefully they will all find a home one day! a little bit of a and a little bit of b. Mostly I choose the colors I like in my house. I have made a quilt to match a room – a baby quilt requested to match the decor. At home, my walls are white and soft furnishings mostly neutral – so I change quilts from room to room or from cupboard to out and proud! I am probably in the "b" and "c" category. I actually have a closet full of "tops" waiting to be quilted, but no hurry because I’ve no where to show them. I also have a closet full of completed quilts with no where to put them. Many are stacked at the end of the bed…sort of like the Princess and the Pea. The problem…I LOVE THEM ALL!!! I must be a B or C. I would probably do better to decorate the room to go with the quilt/quilts, rather than the other way around. Decorating is really not one of my better skills. I’m definitely a "b". I fall in love with a fabric but I don’t think about how it will fit in my home. I can’t wait to read Brigitte’s new book! Thanks for the giveaway! I’m usually select my pattern and fabrics for a specific room, so I guess that would be an (a). However, I love an assortment of fabrics and scrappy quilts which would fit into any spot that needs some pizzaz, (c). b probably….so far I have made quilts to give to family members…now I’m not sure since most of those people have a quilt??? I’m A. I like to work from a perceived idea with color, shapes, where it will live. I really like the suggestion of pixalating a photo to get a color palette. Great! B. I will try to get an idea of the recipients colors for gift quilts. But many things I make are to try patterns and techniques and use what I already have. I would say that I am mostly A and a little bit of B.
I have several quilts that don’t "go" with anything in my house but I use them anyway! The book looks awesome! I would probably answer with B. We have moved a lot so things are always changing in my home! I sort of know what I like and I go with it and then just make it fit in wherever we are!! Thanks for the giveaway – I hope to be your winner!! I fall in love with particular patterns and fabrics and (most often) color combinations and go from there. I try to keep my basic furnishings neutral so that my quilts will fit in. I periodically change my decor style so that particular quilts get their moment to shine. Inspiration for the next quilt is everywhere…usually in the form of a particular color combination or fabric. There’s always a new project in the planning stages in my mind – even as I’m working on another quilt!! I love color and fabric, and I have a stack of various styles and colors on display in my home. I think of quilts as pieces of art, and I can appreciate each one on its own merits, even if it doesn’t exactly "go" with my decor! I typically am excited about a fabric line or a pattern and that gets me going! I would also go with B. I try to limit projects to what will fit with my house, but often I fall in love with fabric and start projects that have no place in my house. Sometimes once we move those orphan pieces find new life in the new house though! The few quilts I have finished I am using but there are many tops that have never been quilted. Not sure what I would do with them if I took the time to finish them. I would answer B. I try to find materials that will be beautiful on their own, and they are, but then they’re sometimes awkward in the rooms I’d like to use them. Looking forward to studying this book! I don’t really do any of the three options. Most of my quilts are holiday-inspired, so I can always display my quilts during the appropriate time of year. I can easily rotate my quilts in and out, giving each of them a time to shine. I am in the B group. I usually make a quilt because of the fabric or the pattern. It most likely isn’t going to match what is in my home, but I generally find a spot for it. Hmmm… since many (ok all) of the quilts I’ve finished have been gifts I do try to be sure they are something that the person will enjoy and be able to use. I hope they reflect their style. However, fabric stashing is another story… All too often I fall in love with a fabric with no idea where I might use it, but buy it anyway. I’ve been trying to be better and more intentional, but I still fall into the trap sometimes! So true, I have two quilt racks full of quilts that are beautiful but fit no where. That is not to mention the other quilts I have stashed unseen else where. I also custom design quilts for others, and have a difficult time helping them consider their spaces as we pick colors. Color is hard to choose and once chosen sometime hard to find the right shade in the market place. I’m in between, sometimes I know exactly where a project is going and sometimes not. It’s not a bad thing. My answer is sadly "C". I fall in love with either the pattern or the fabric-make the quilt and then try to fit it in which doesn’t always work! I’m a b or c kind of quilter. Many of the quilts I make are gifts and I do try to fit them to the recipient’s decor if I know what it is. Sometimes it is a guess. For myself, I have a hodgepodge decorating style so I make quilts I like without considering where they would fit. I’m a "B", but I really want to be that "A" quilter. It is sad to spend time and money on a quilt and then have no place to enjoy it since it doesn’t fit any of my rooms. It is that beautiful fabric that pulls me in. This was inspirational and eye-opening. thank you for the chance to win. I have lots of quilts that are stashed in a closet. I have the unfortunate quality of liking everything, so therected is a wide range of styles. I am a c person but that’s OK because I will give them away if I don’t use them.